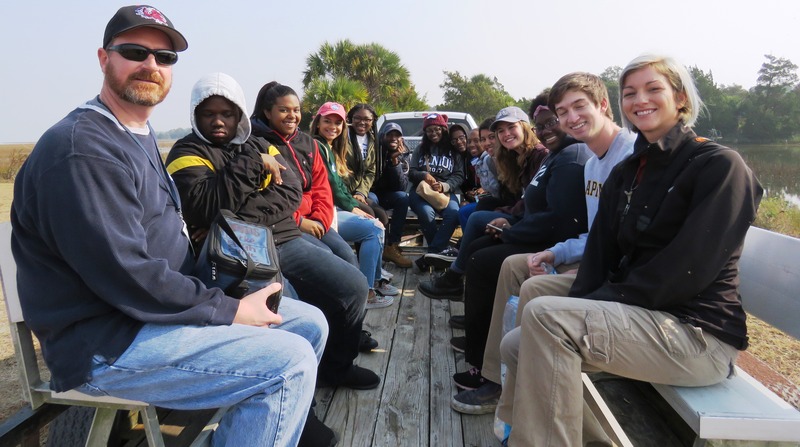 Charleston, SC – November 16, 2016 – 15 students from Burke High School boarded their activity bus early on a foggy Wednesday morning with their chaperones. 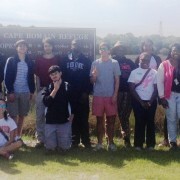 It didn’t take long for their bus to arrive at the first stop for the day, Wando High School. 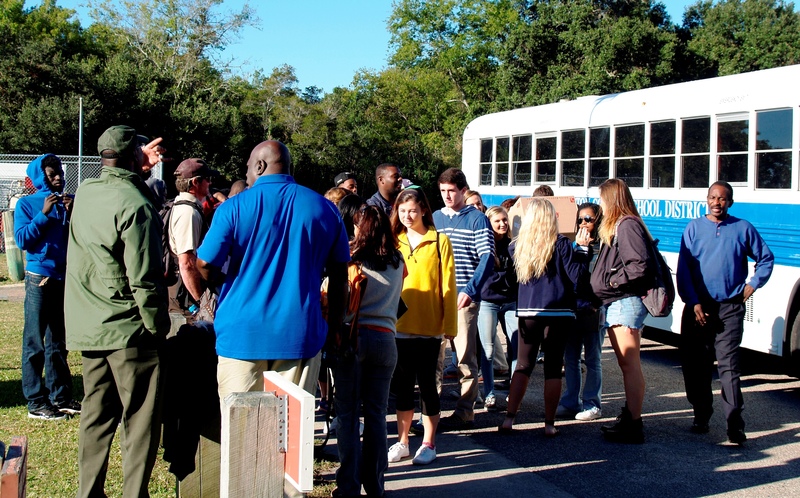 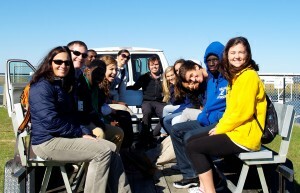 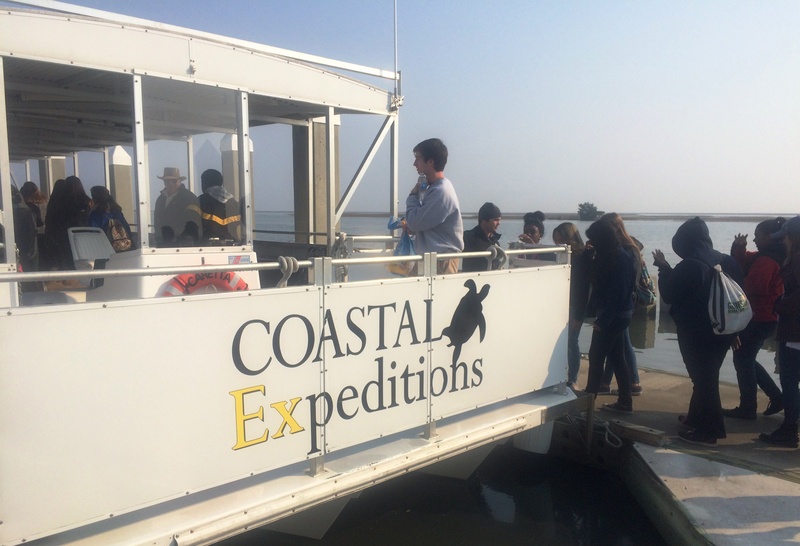 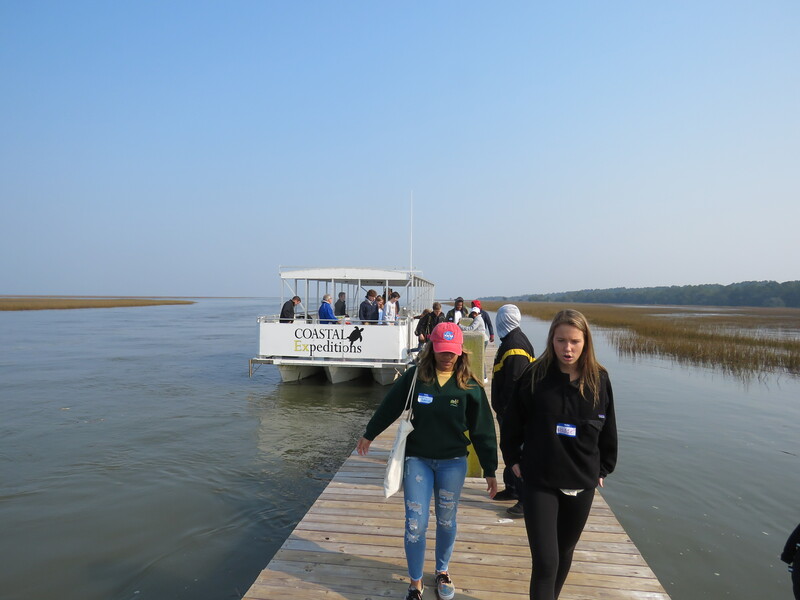 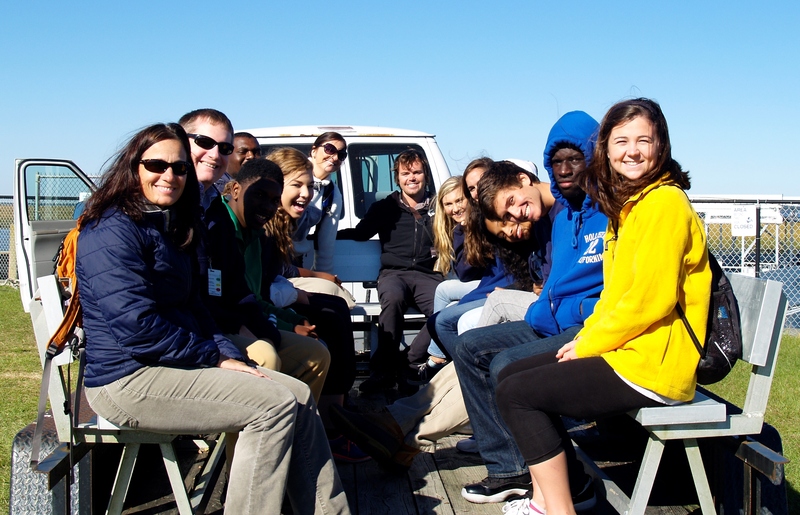 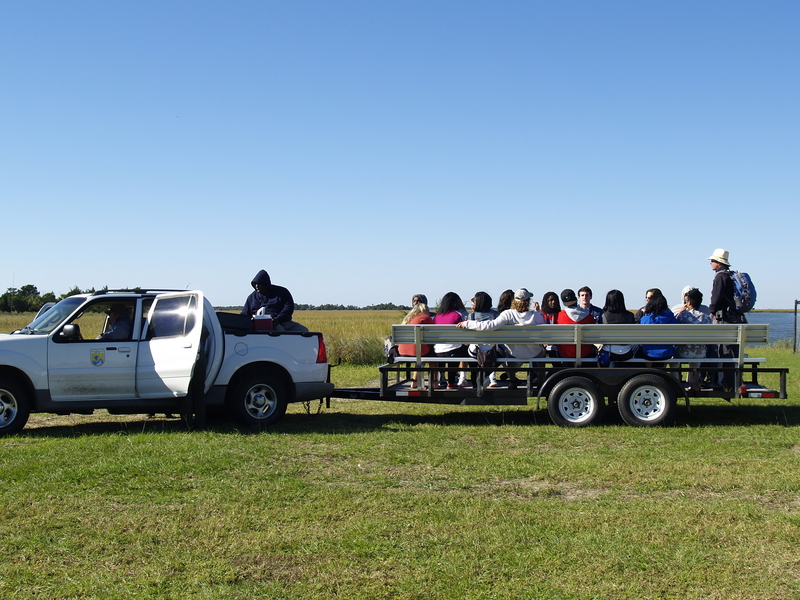 The 15 students from Burke HS were introduced to 15 students from Wando HS, and after getting to know each other a little bit over breakfast, the whole group boarded the activity bus to ride up 17 North to Cape Romain National Wildlife Refuge. 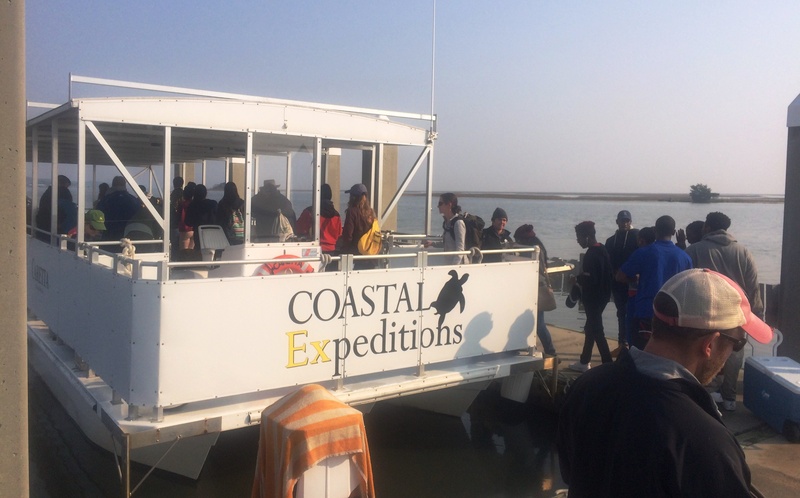 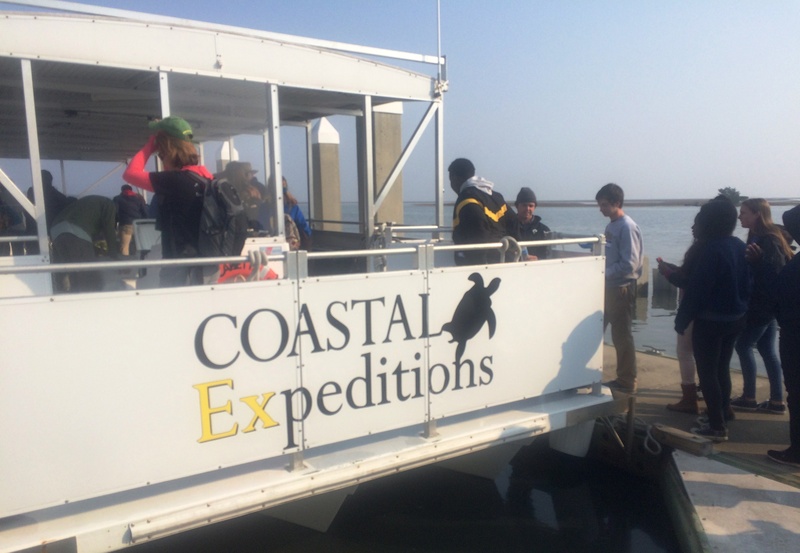 When the bus arrived at Garris Landing to meet their Coastal Expeditions ferryboat, students piled off and grabbed the coolers full of the provisions for the day’s trip to Bulls Island. 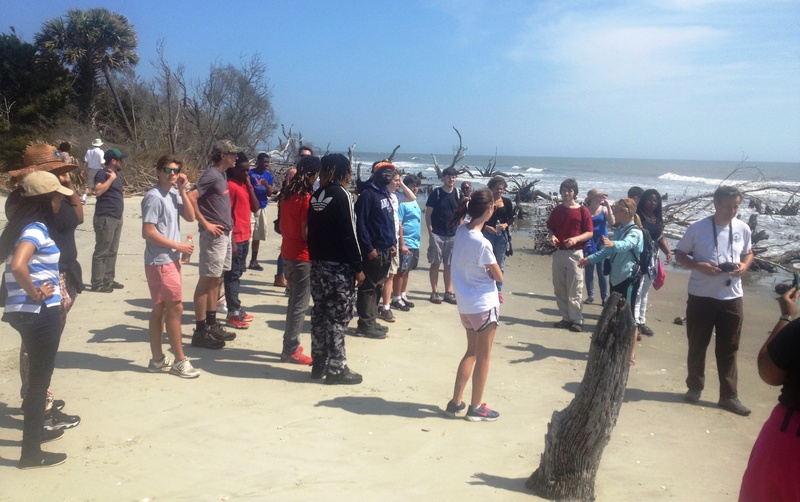 These 30 students were chosen by their teachers to participate in a very special structured field study called Over the Horizon. 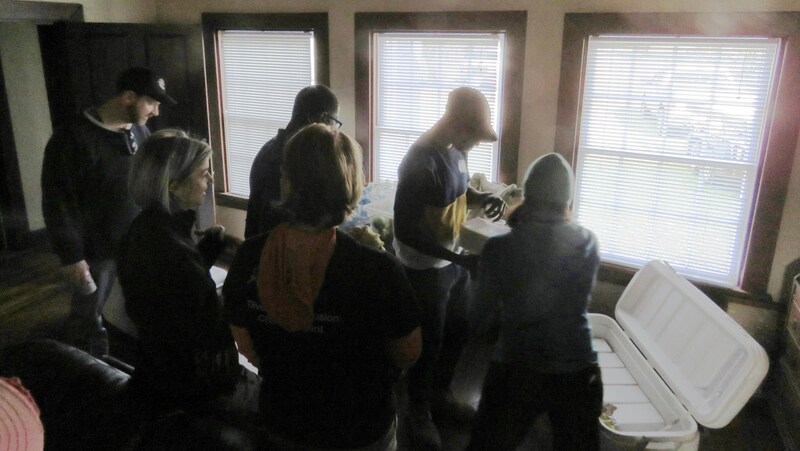 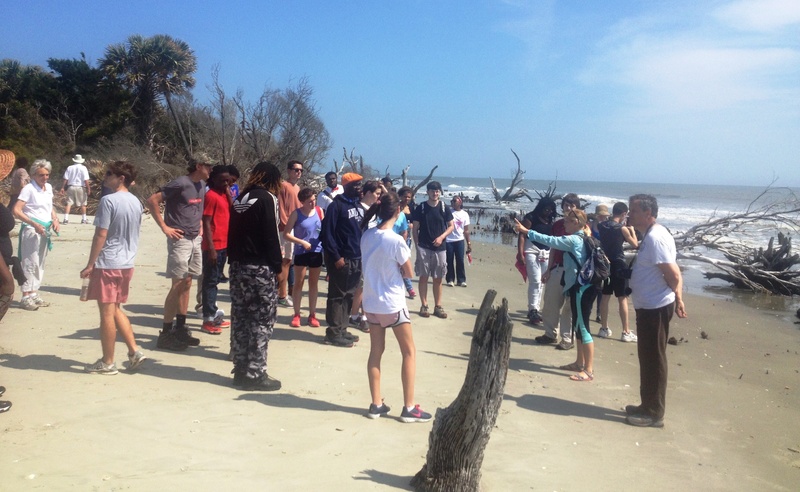 The idea for the trip was conceived over 5 years ago by a small group of Charlestonians for their Riley Institute Diversity Leadership in Action project, and has endured thanks to several original members’ support. 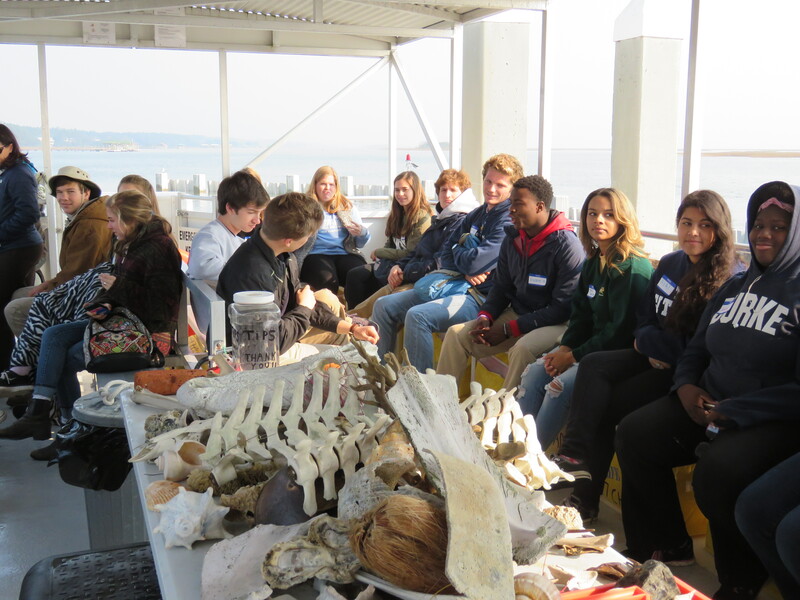 The trip’s focus centers around ensuring high school students understand the value of biological and cultural diversity. 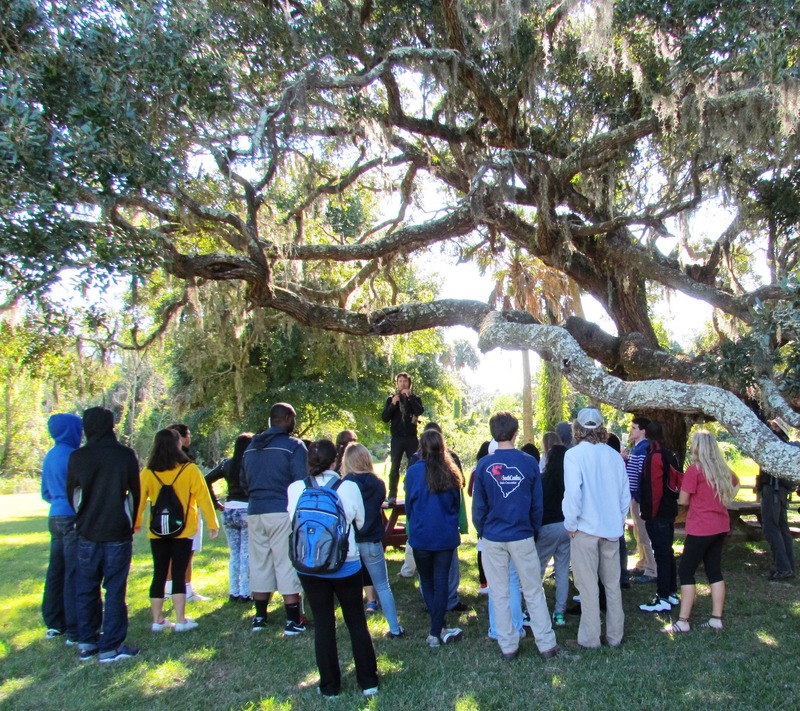 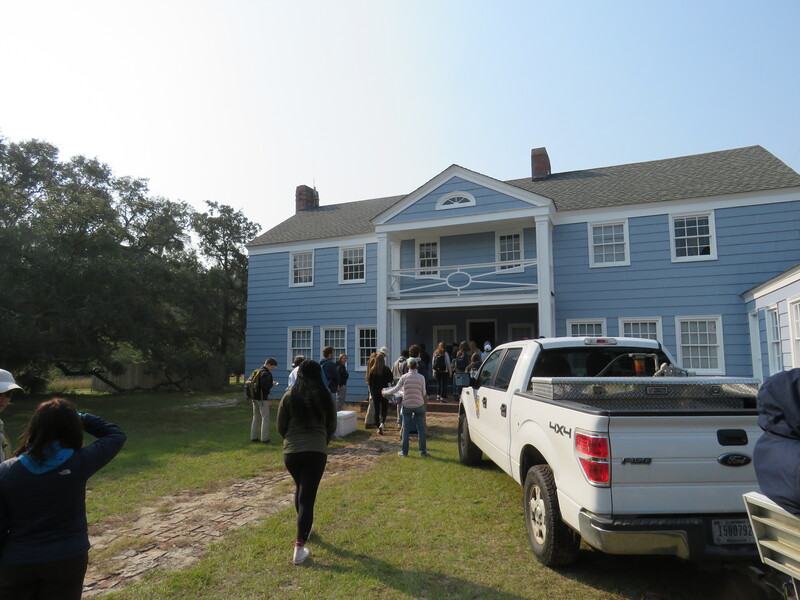 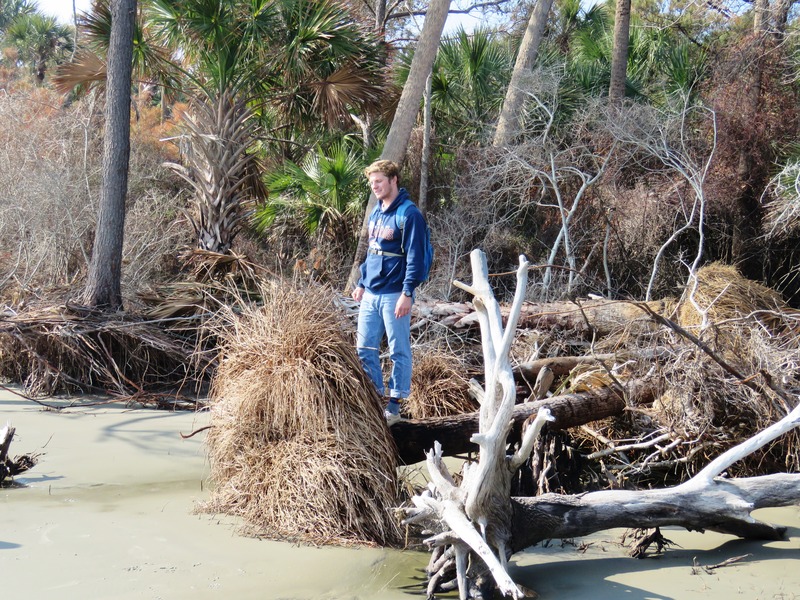 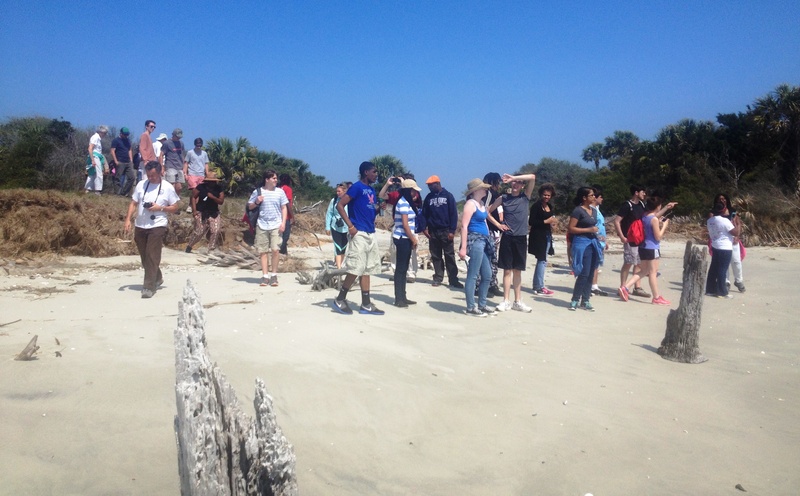 Students got to visit historic sites, walk the famous Bulls Island Boneyard Beach, see many, many alligators, and enjoy lunch at the Dominick House, the island’s only dwelling originally built in the 1920’s as a family hunting cabin. 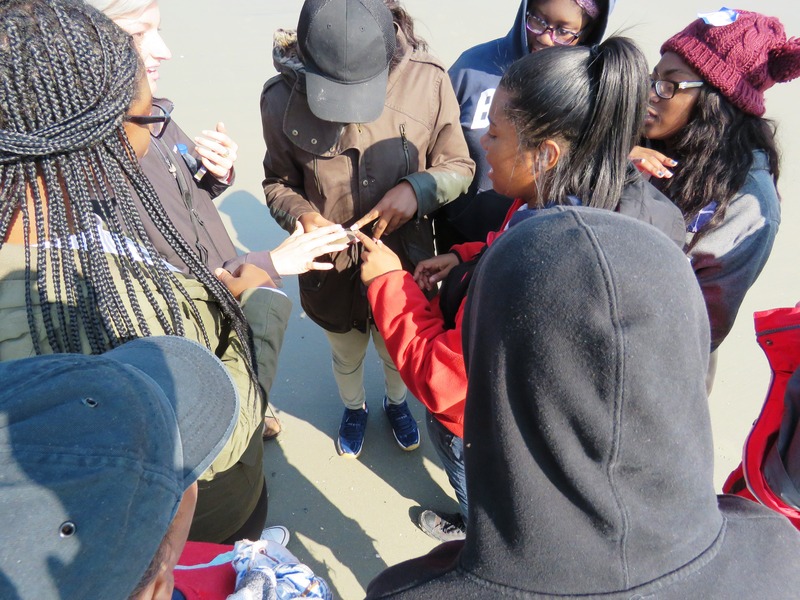 On the beach students participated in team building exercise and had time to explore and collect shells. 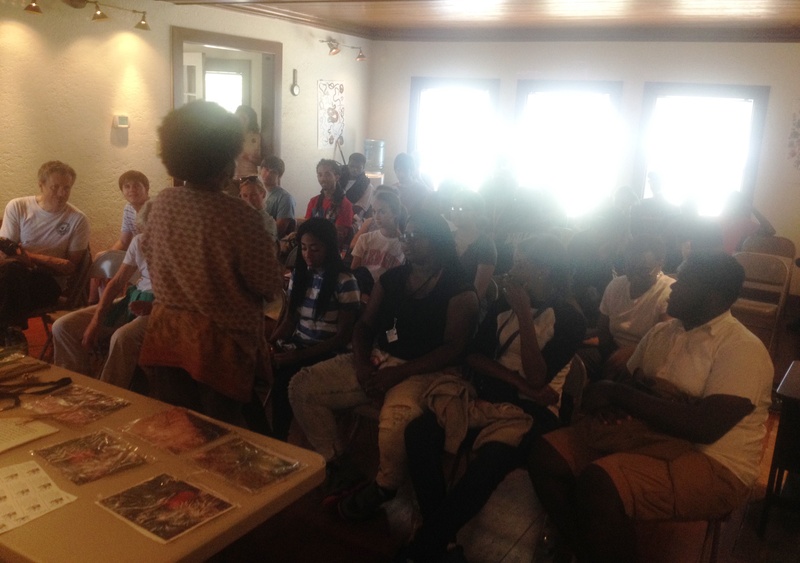 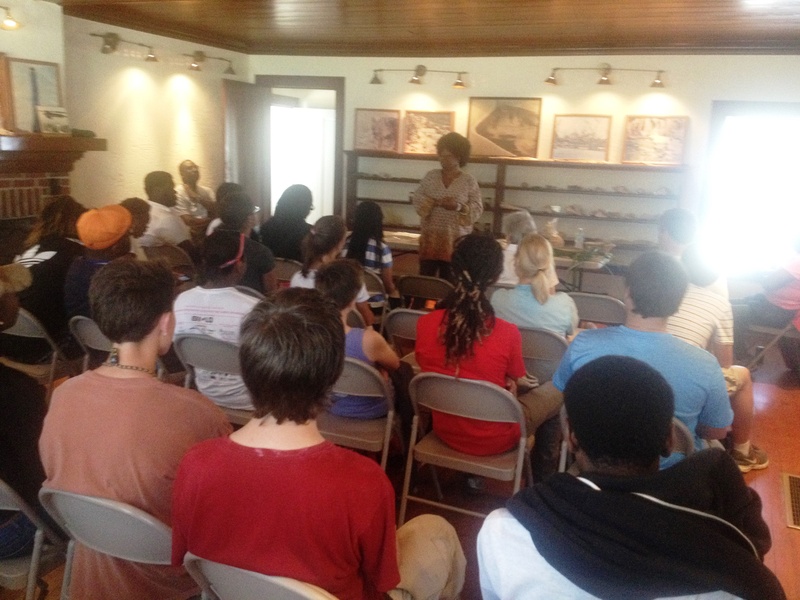 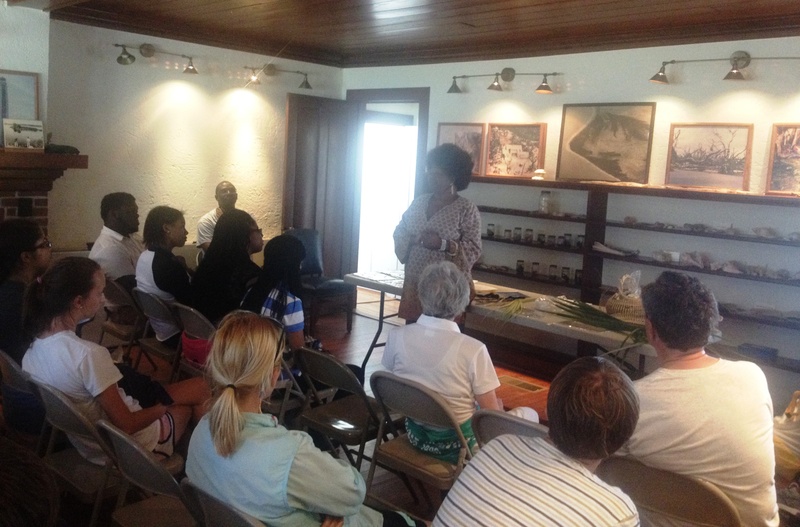 The island visit ended with a lively lecture on Gullah culture and the art of sweetgrass basket sewing by local legend Ms. Vera Manigault. 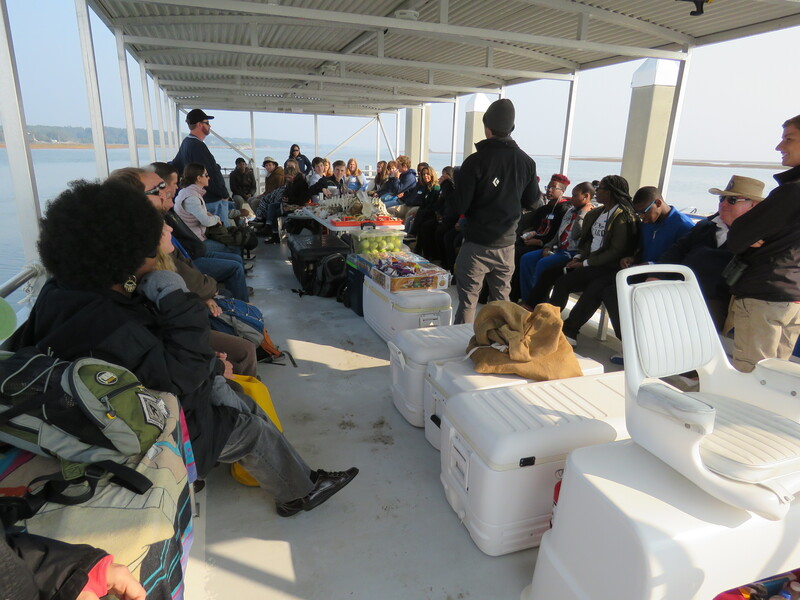 The boat ride back to Garris Landing seemed quick as the group reviewed the day’s events and exchanged contact information to stay in touch. 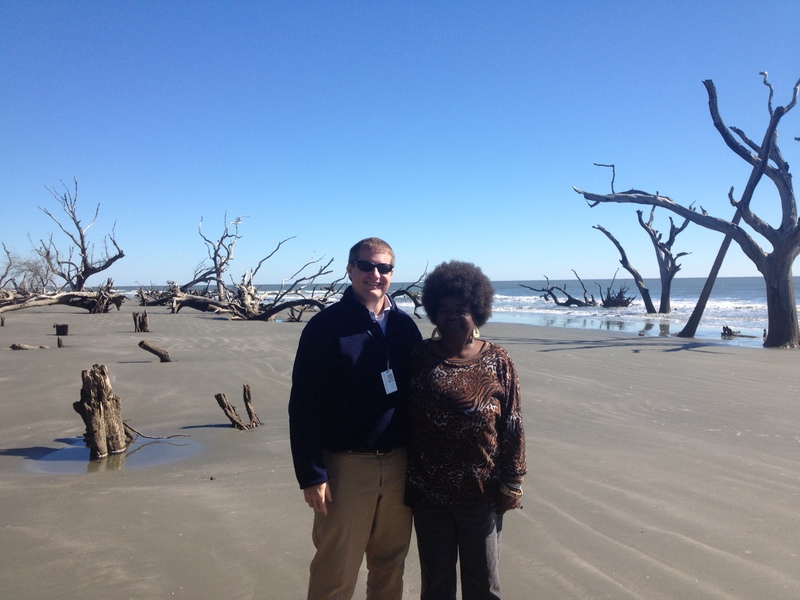 Two principals from high schools in Horry County participated in the trip and plan to replicate the program in their region. 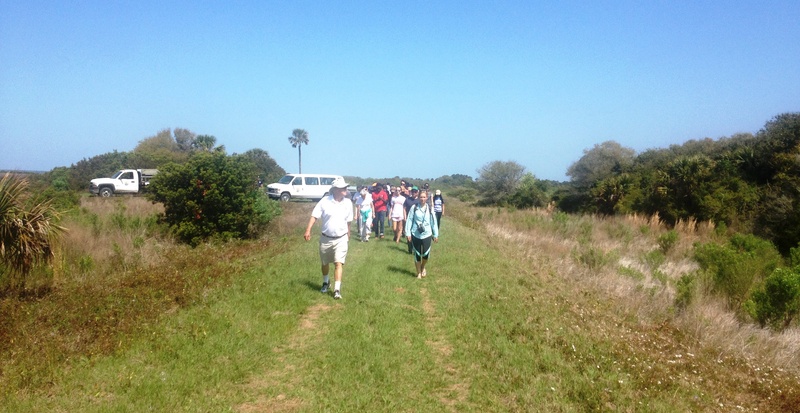 Huge thanks to Brian Wells for his continued leadership and generous support of the Over the Horizon project. 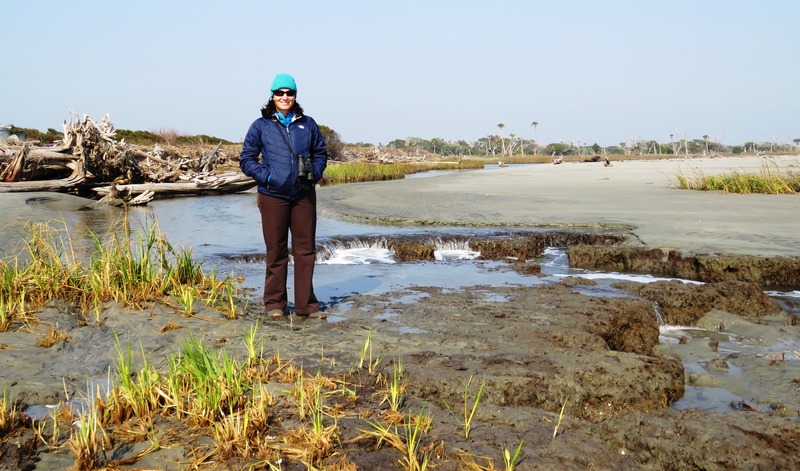 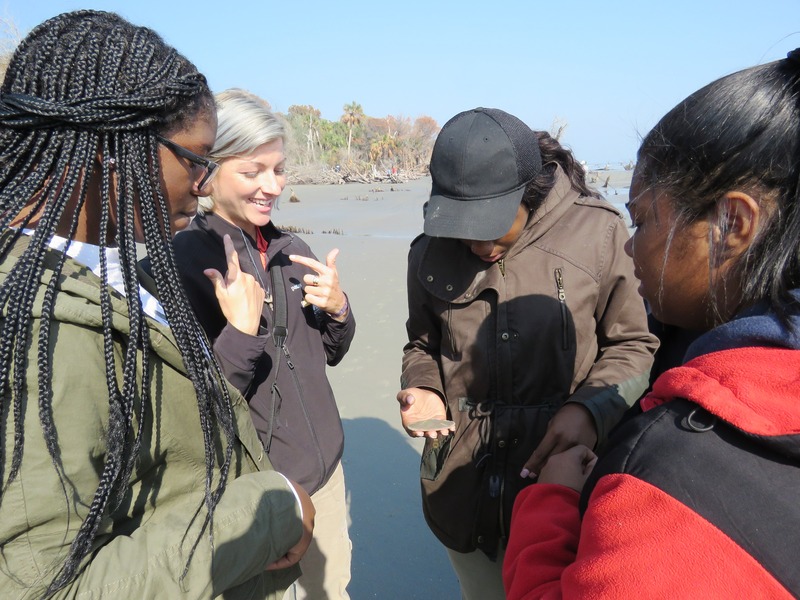 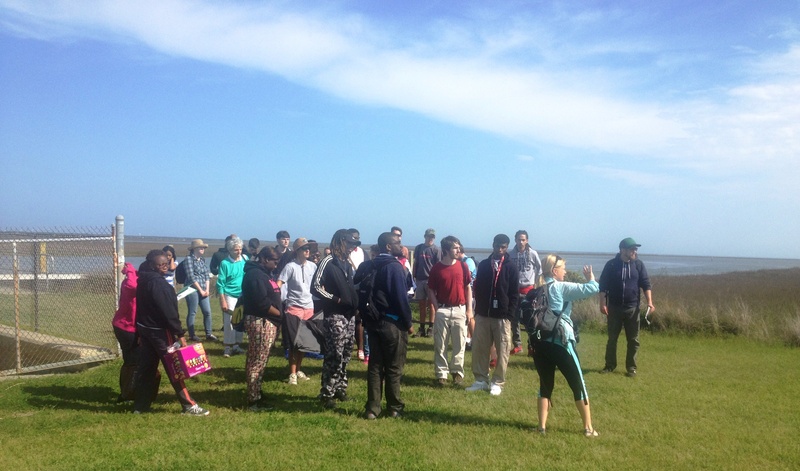 And, thanks to Tricia Midgett, Visitor Services Manager at Cape Romain NWR, the amazing team at Coastal Expeditions, Ms. Vera Manigault, all the volunteers, and the educators and students from Wando and Burke high schools for making it another excellent experience for all involved. 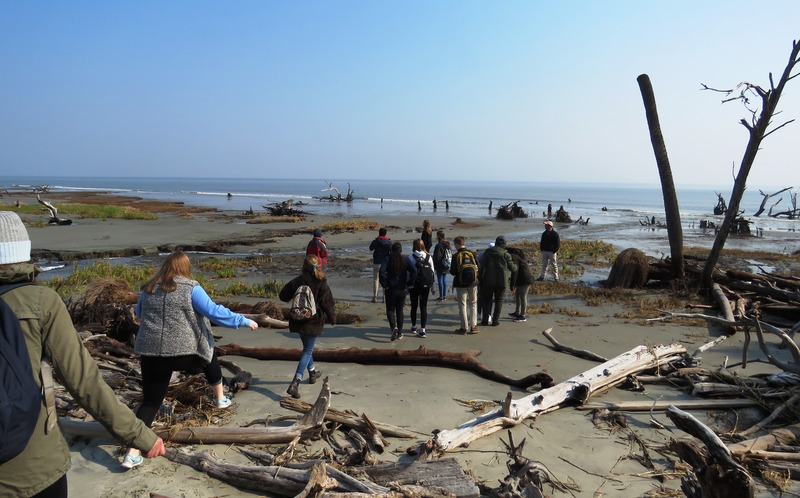 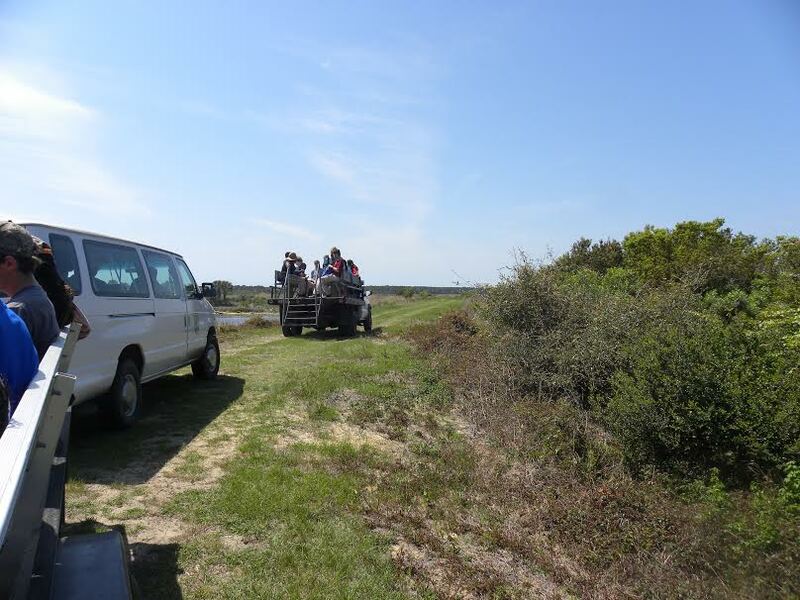 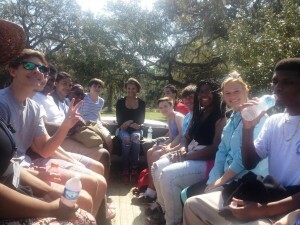 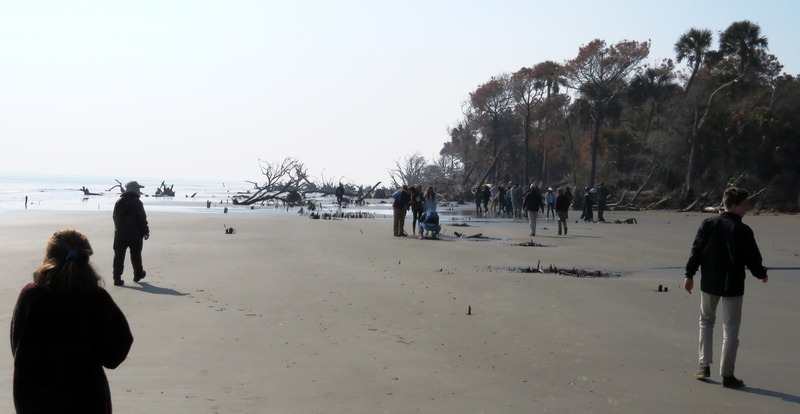 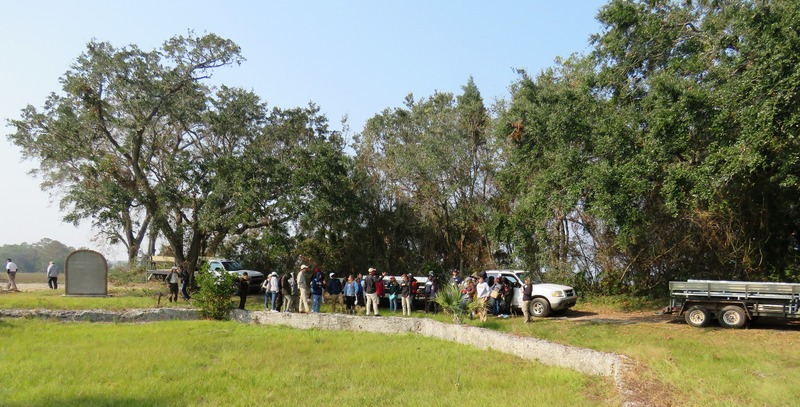 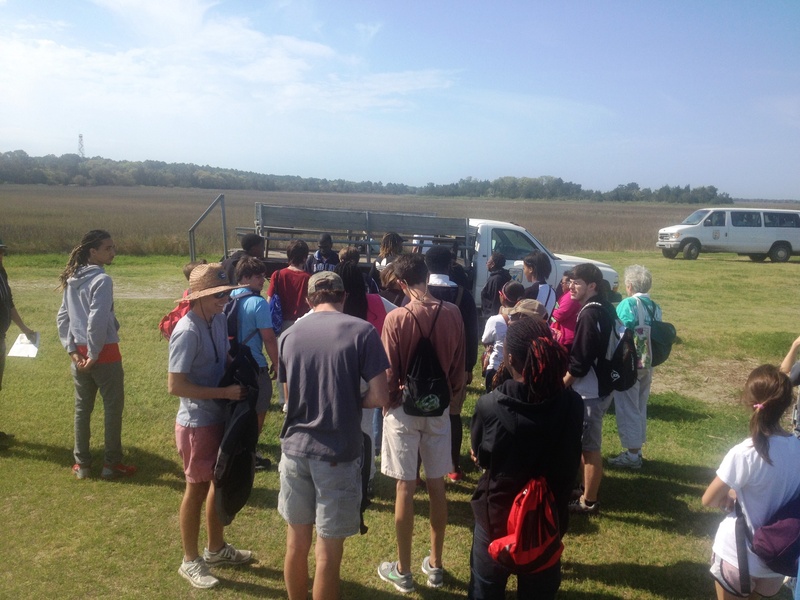 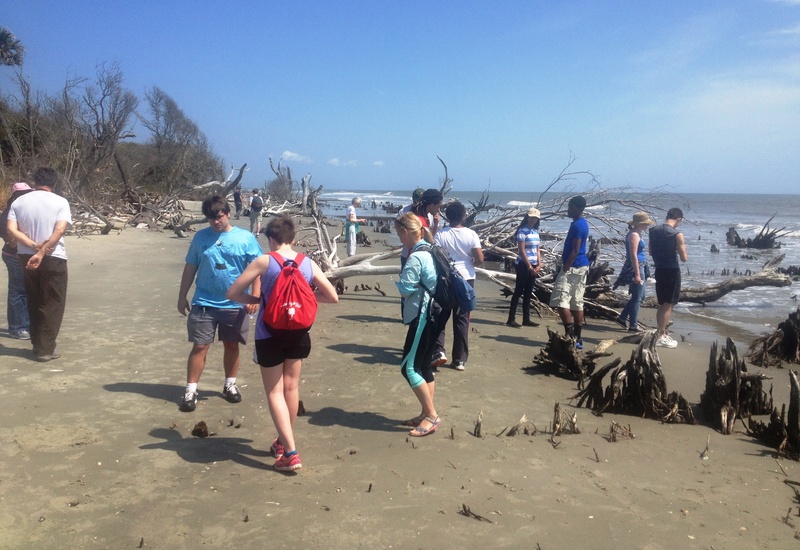 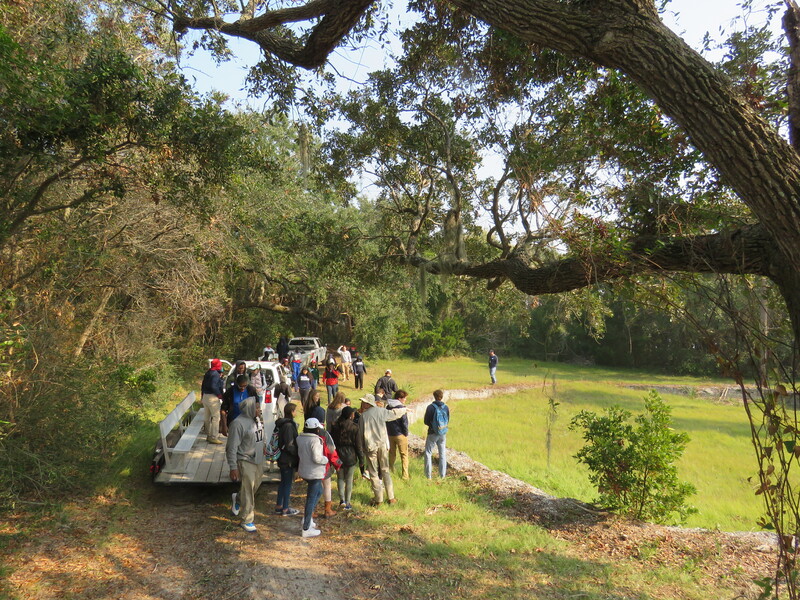 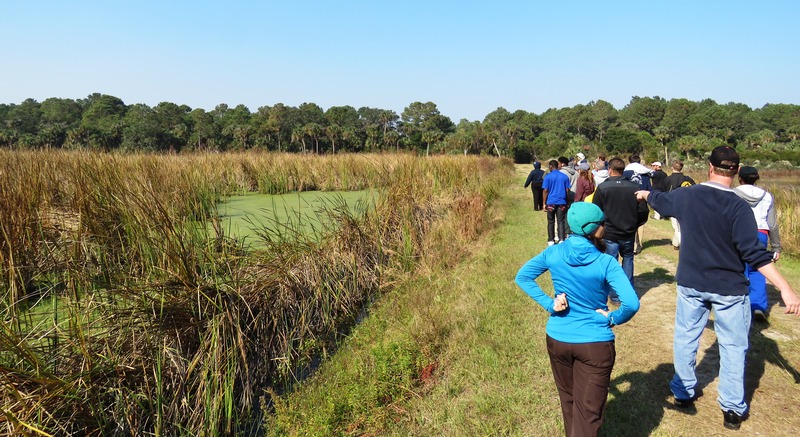 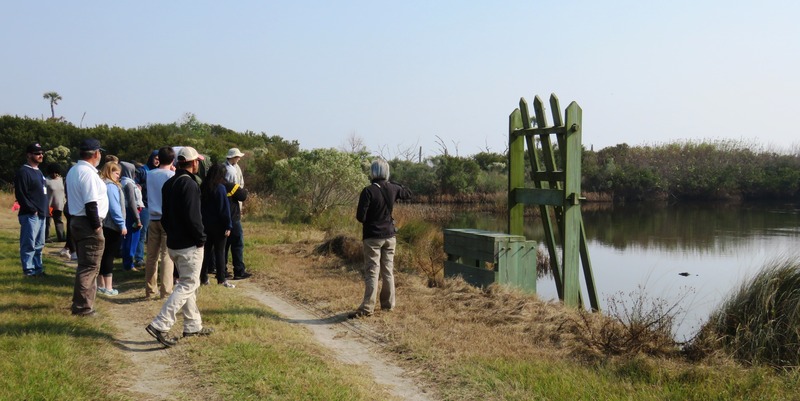 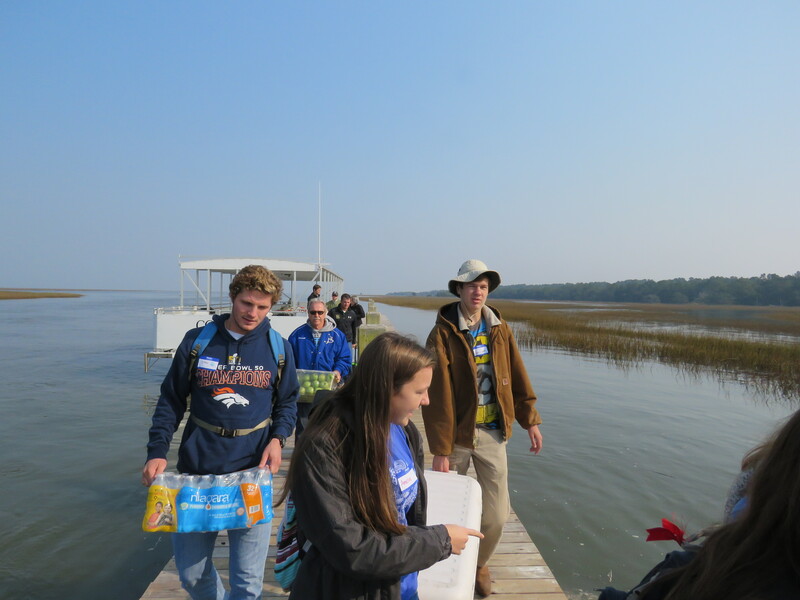 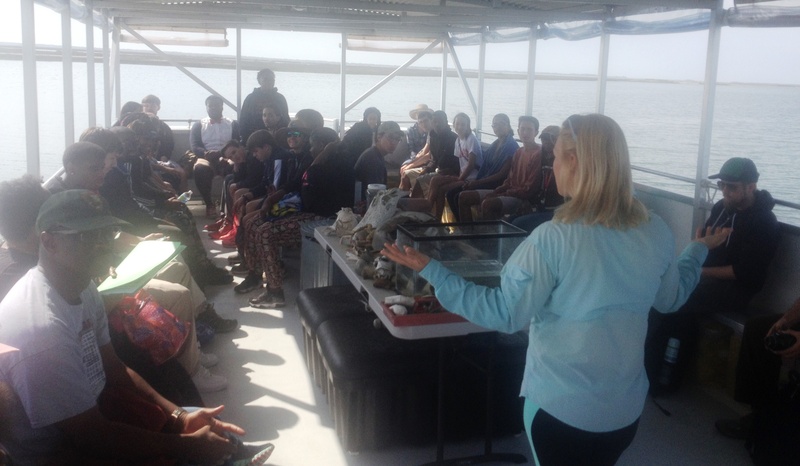 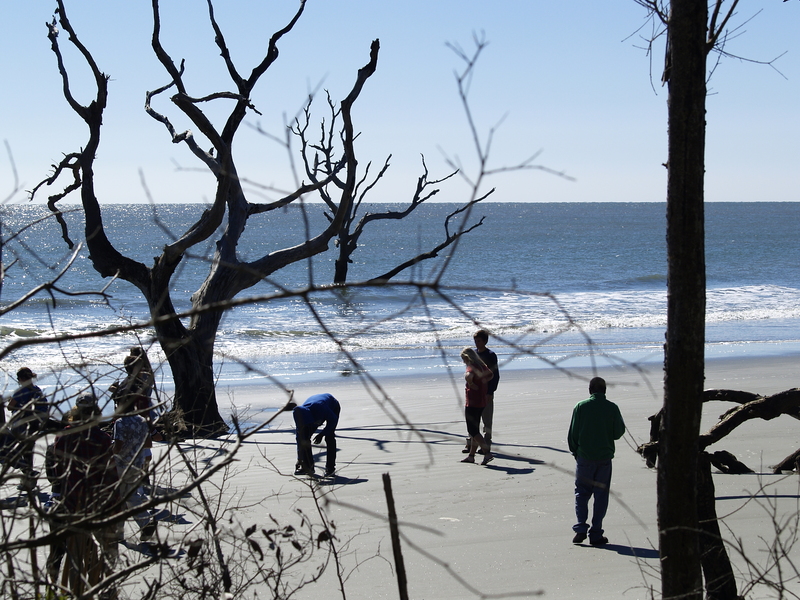 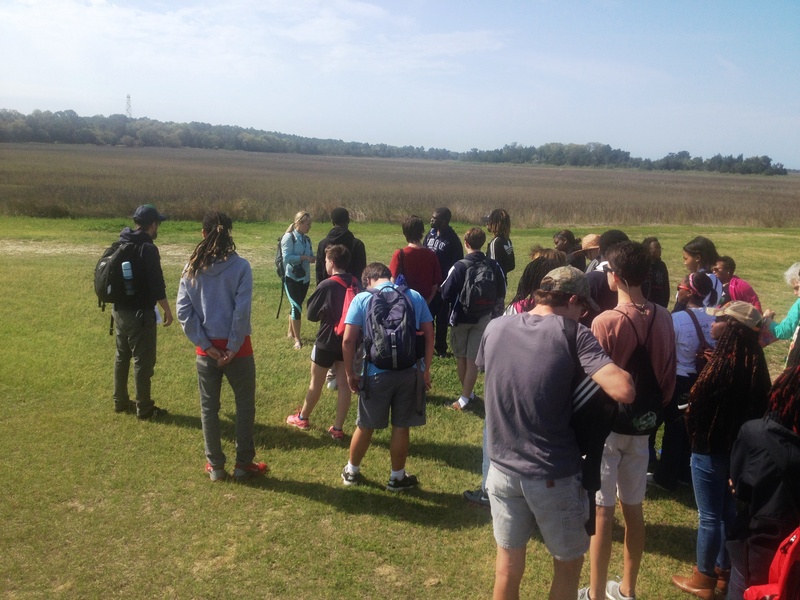 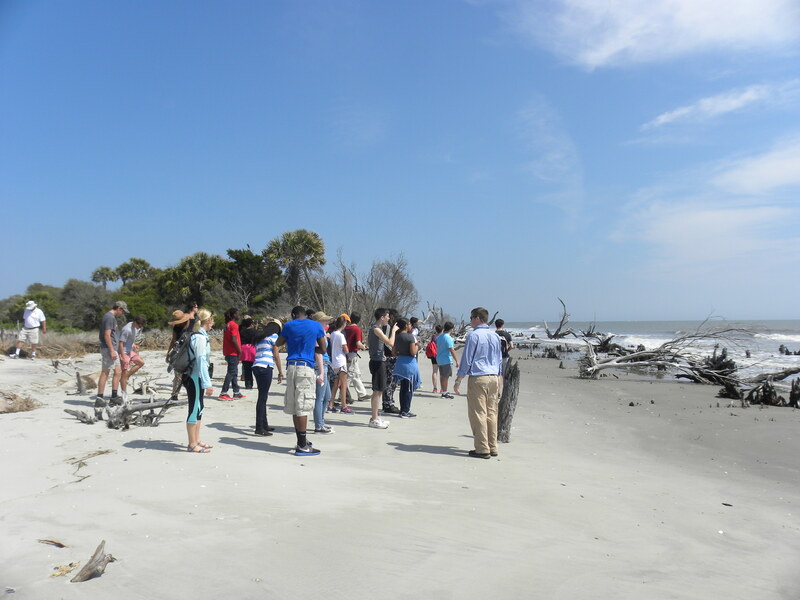 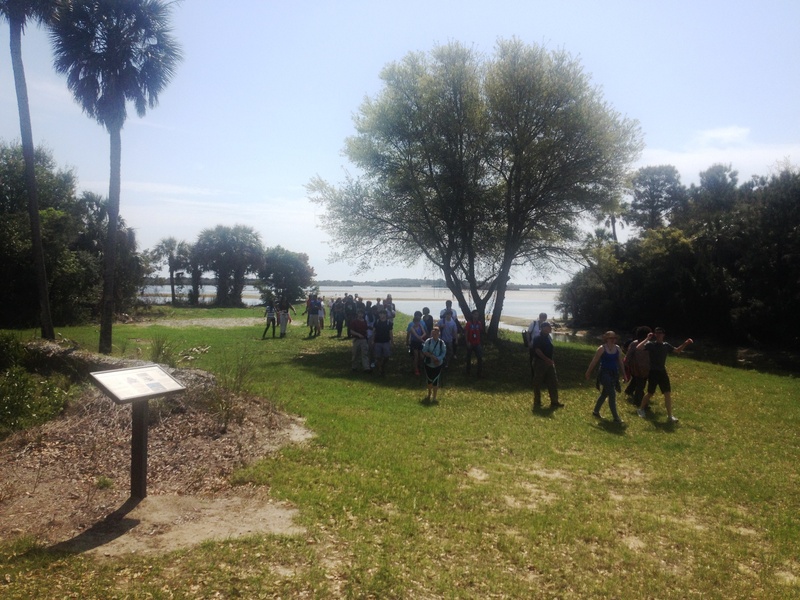 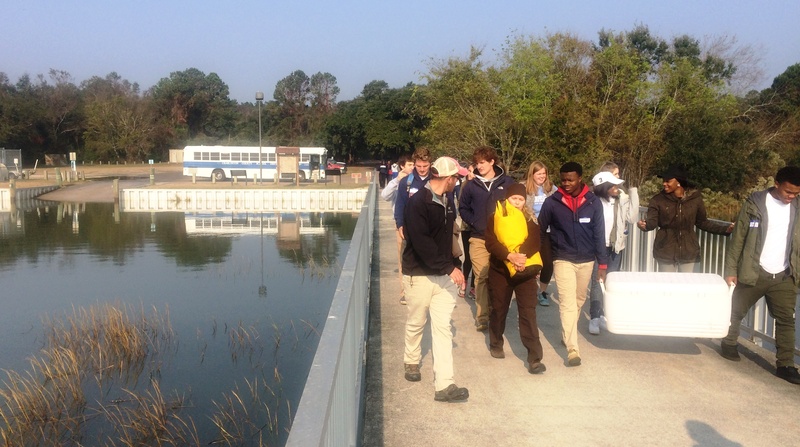 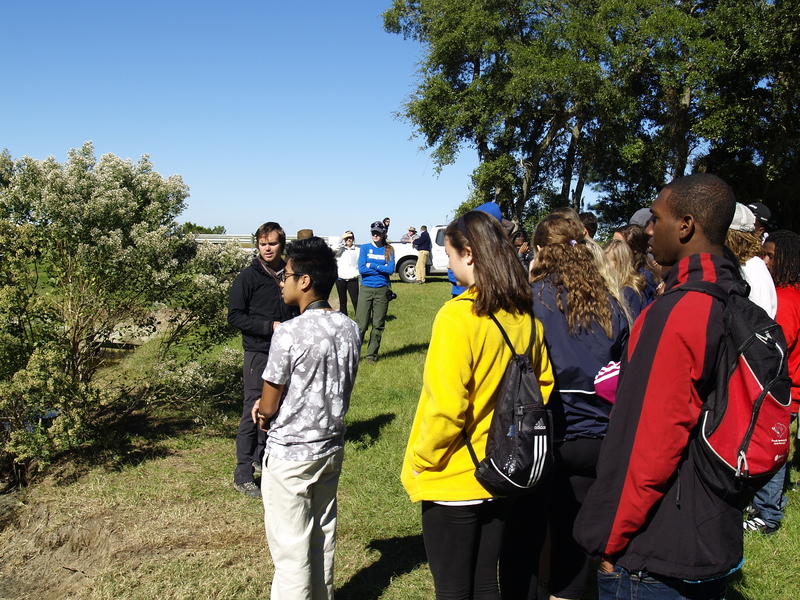 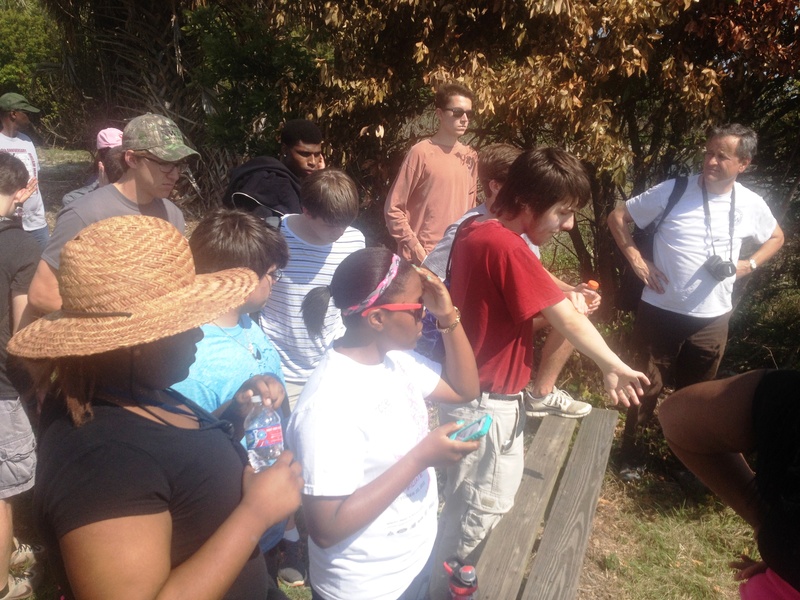 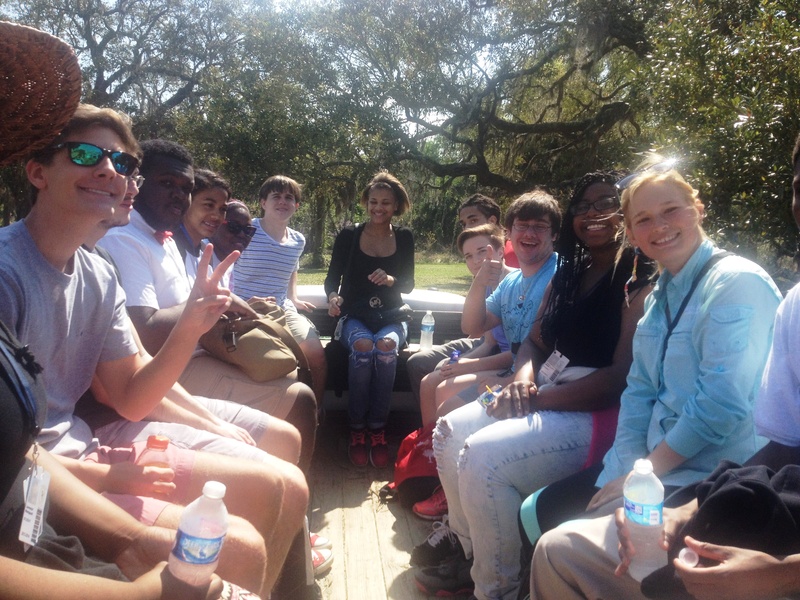 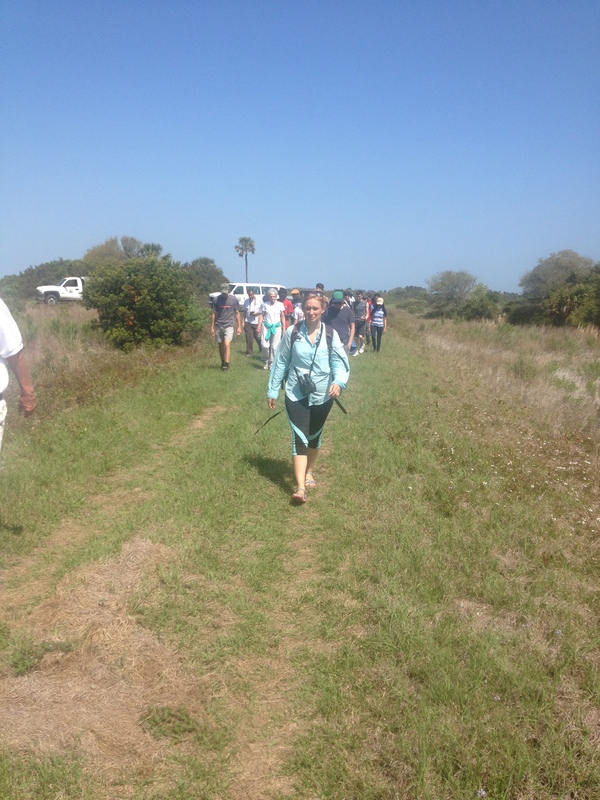 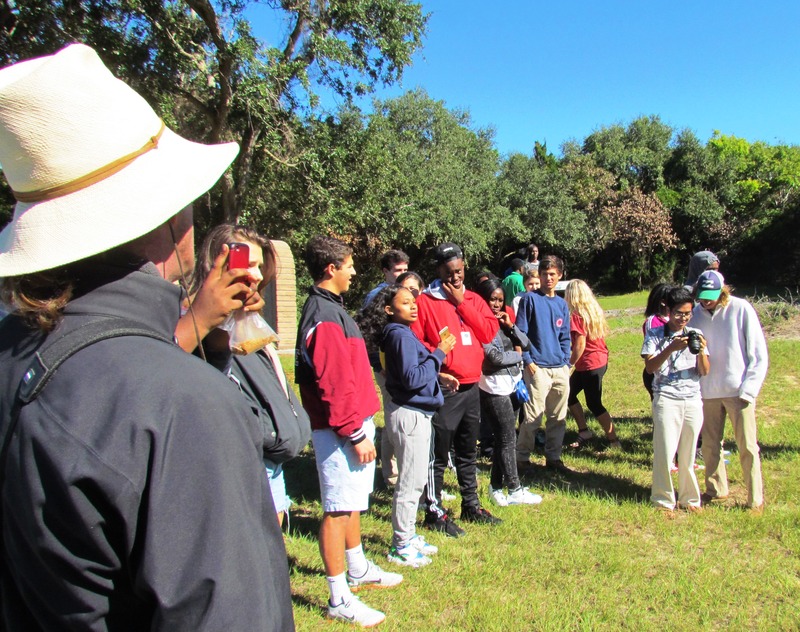 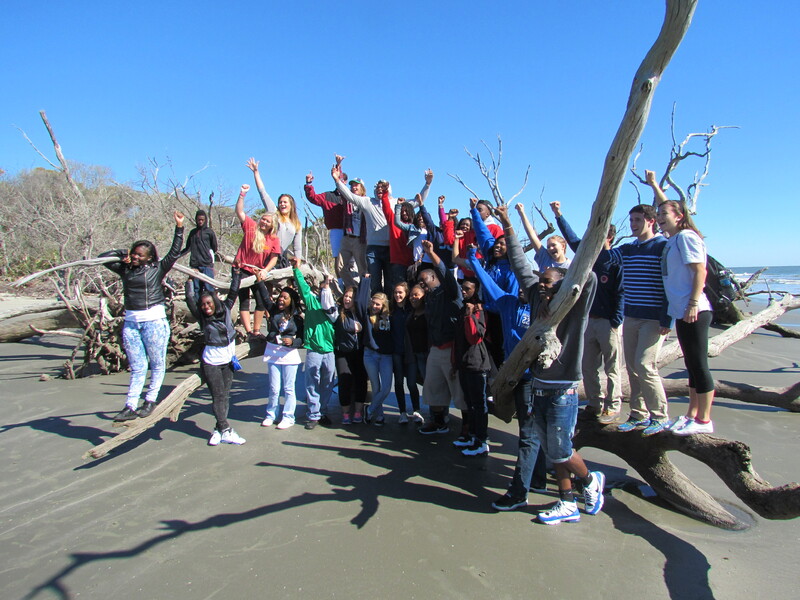 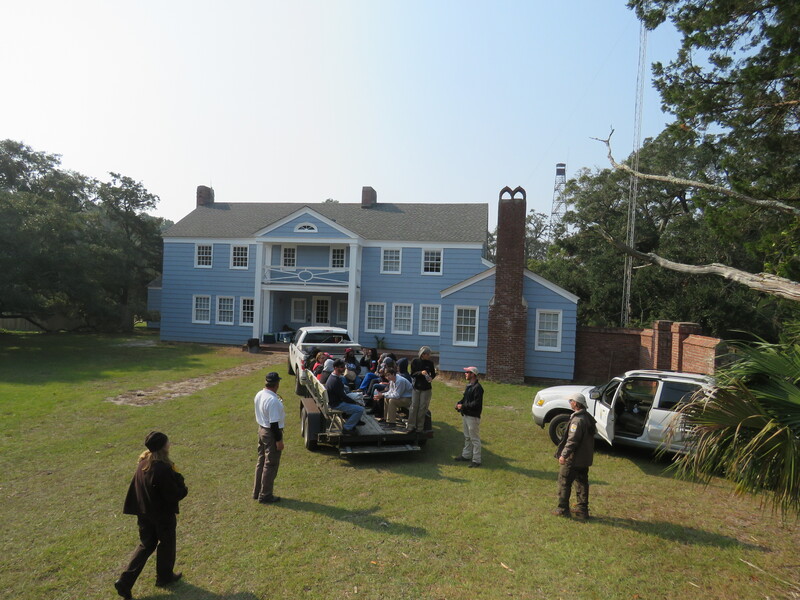 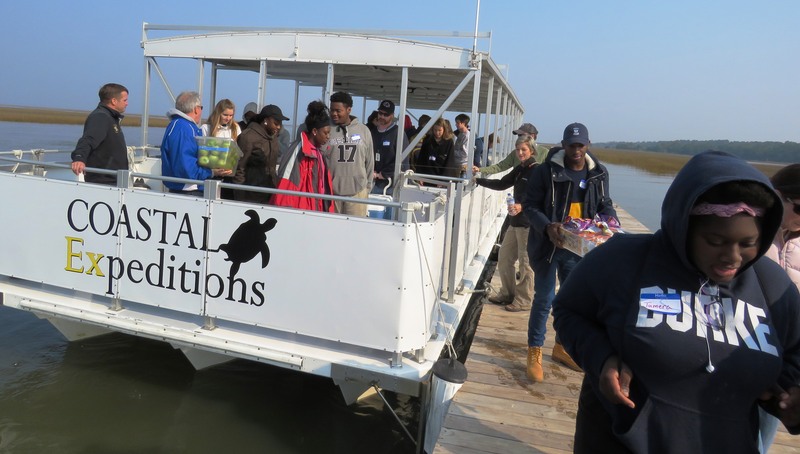 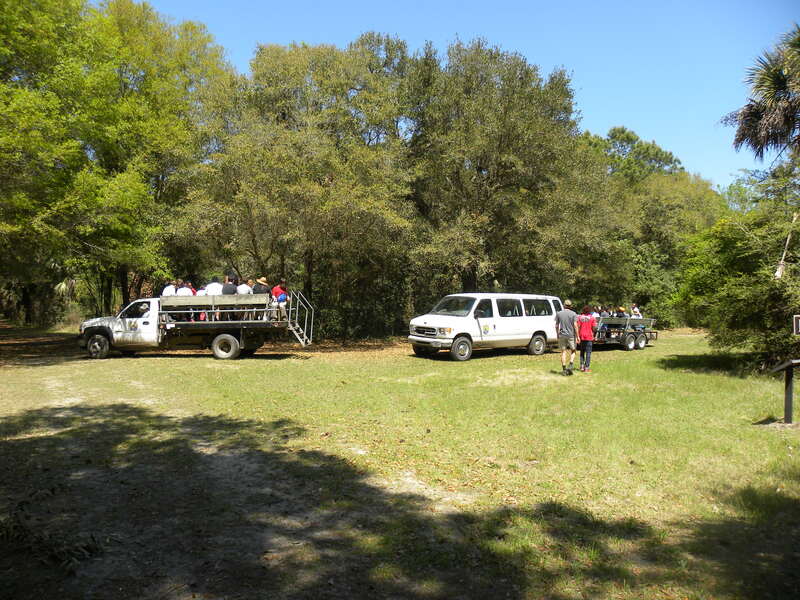 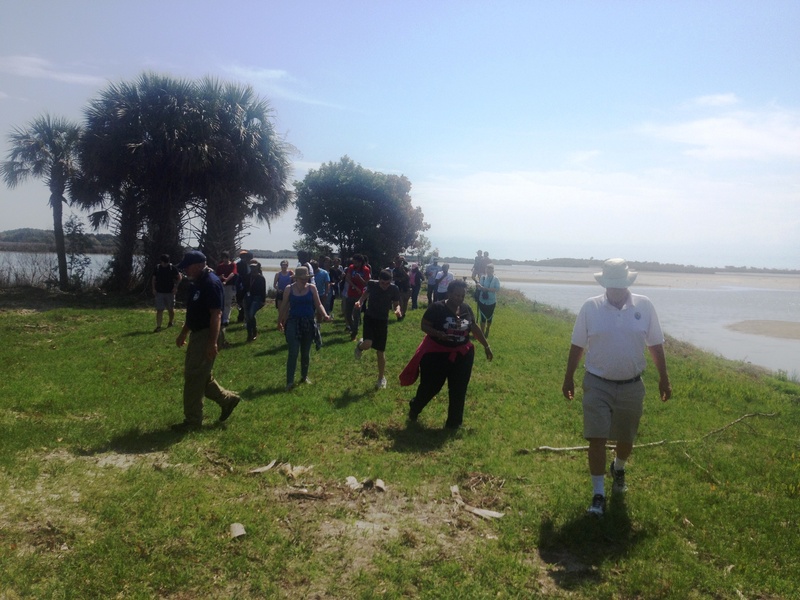 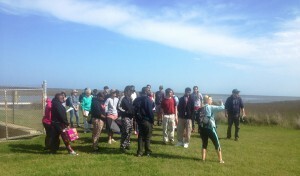 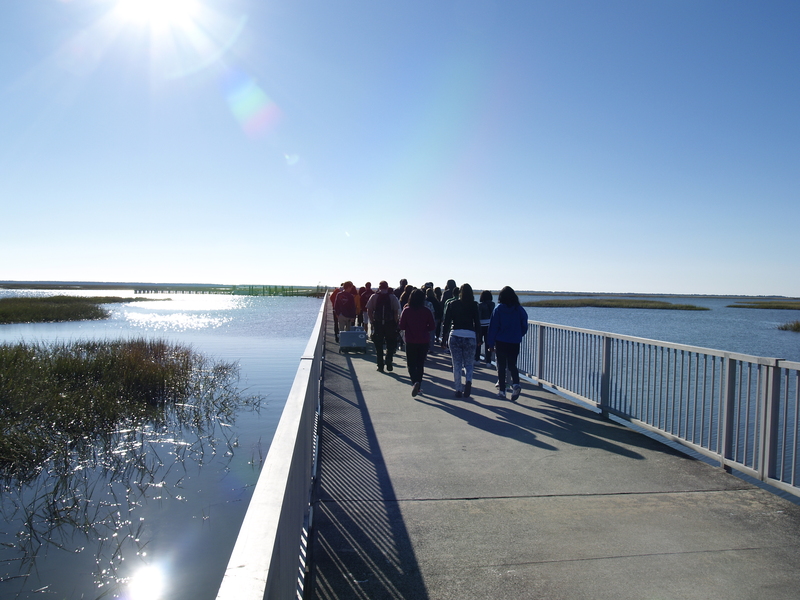 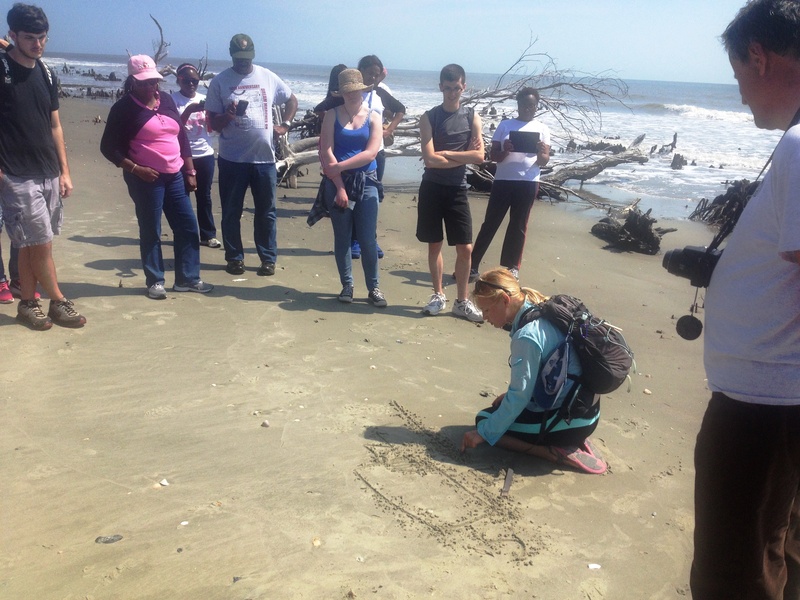 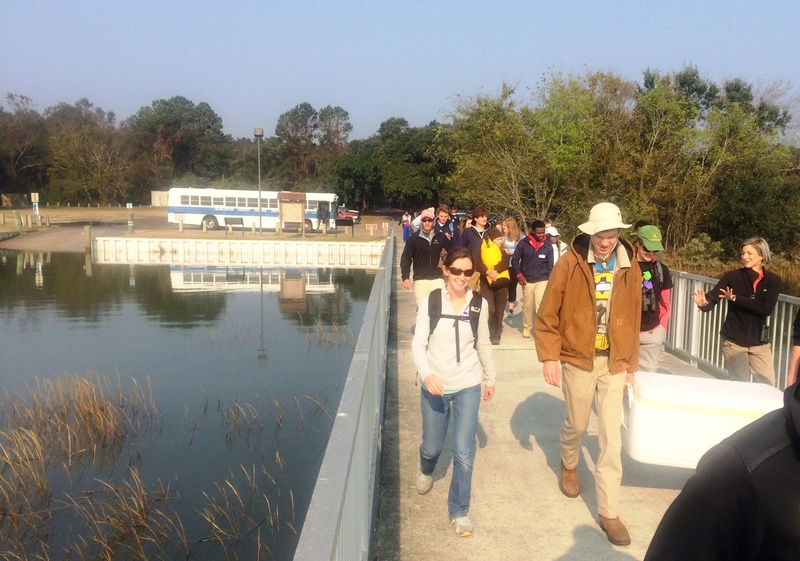 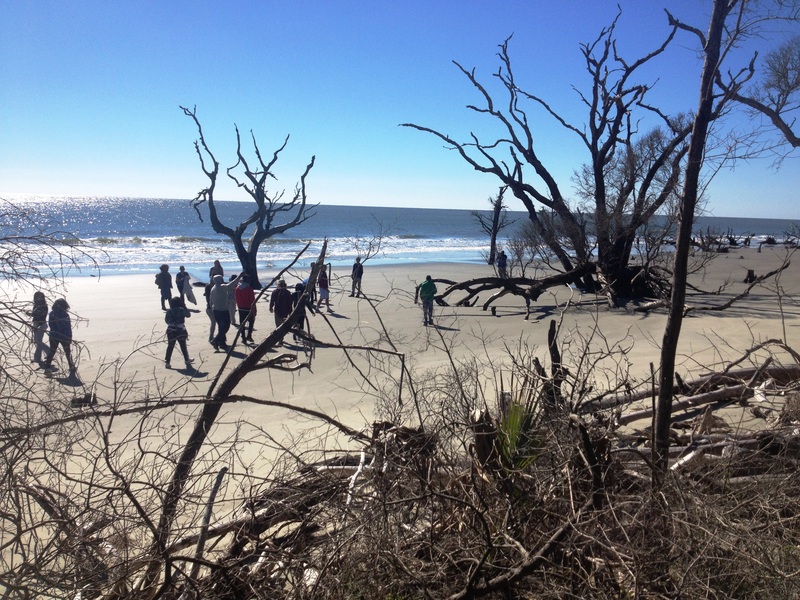 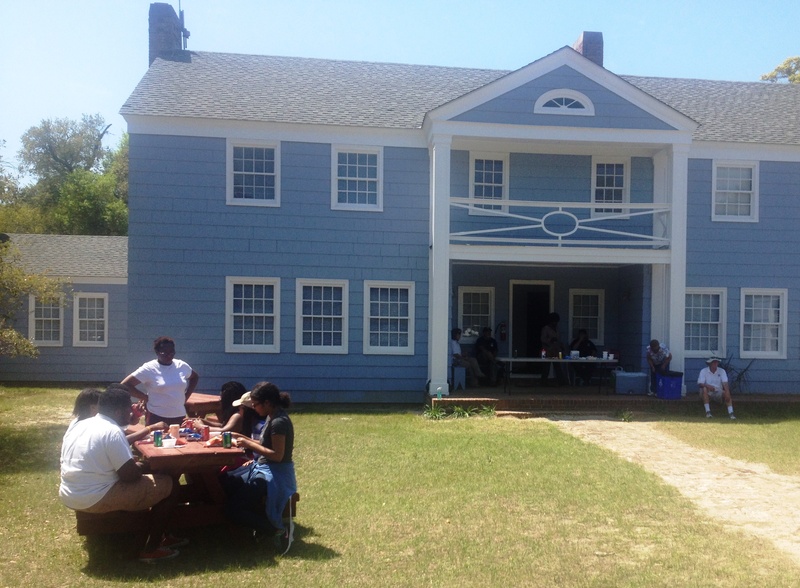 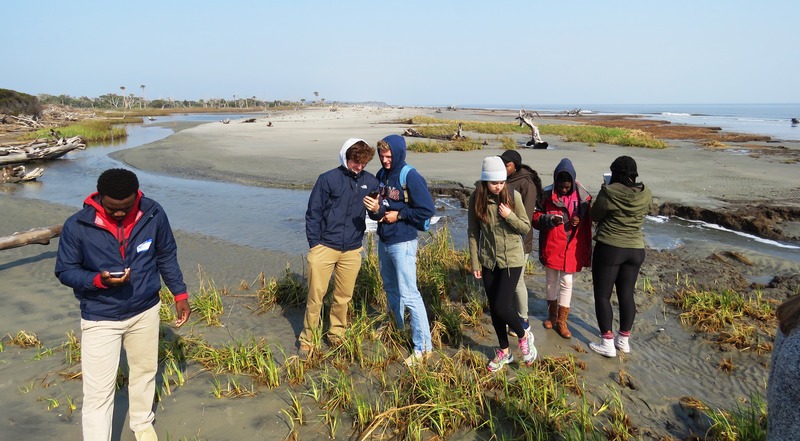 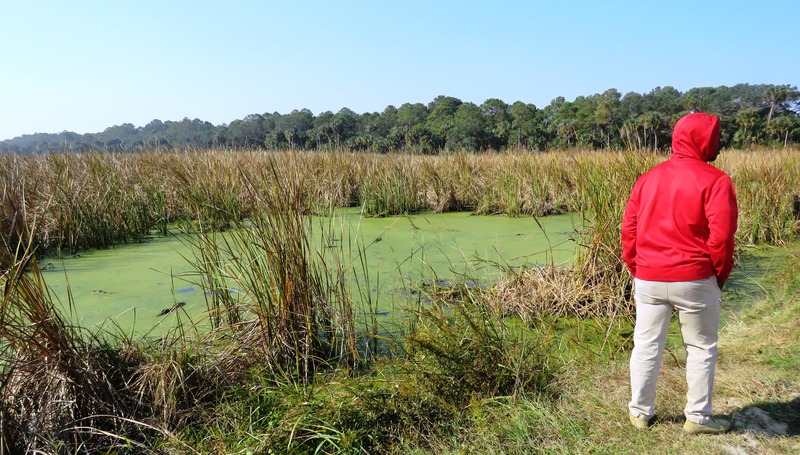 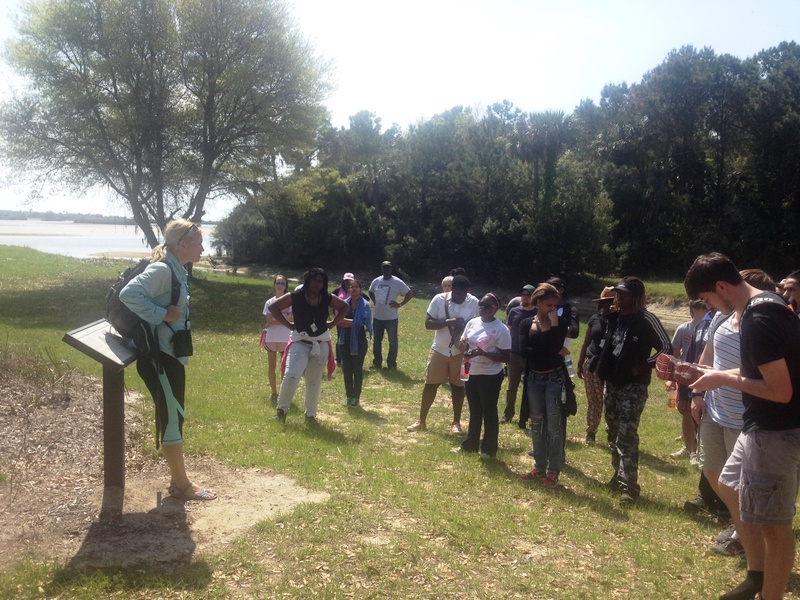 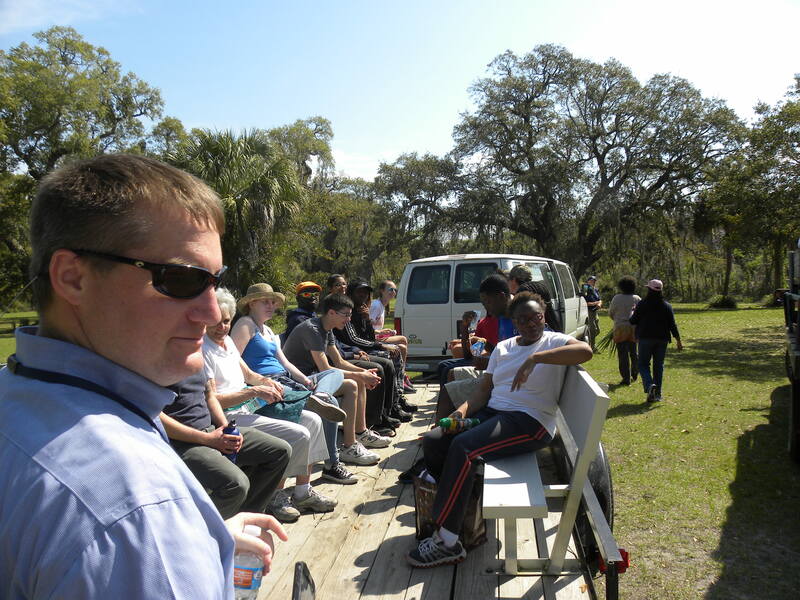 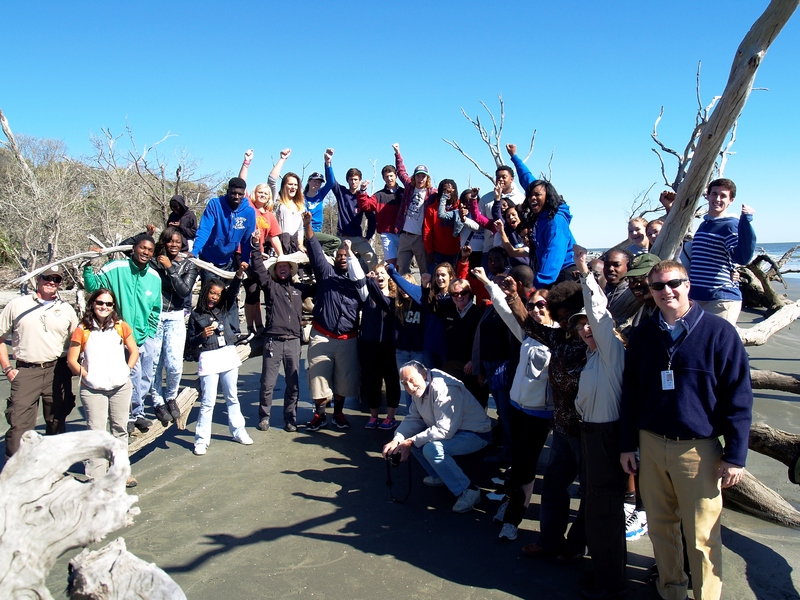 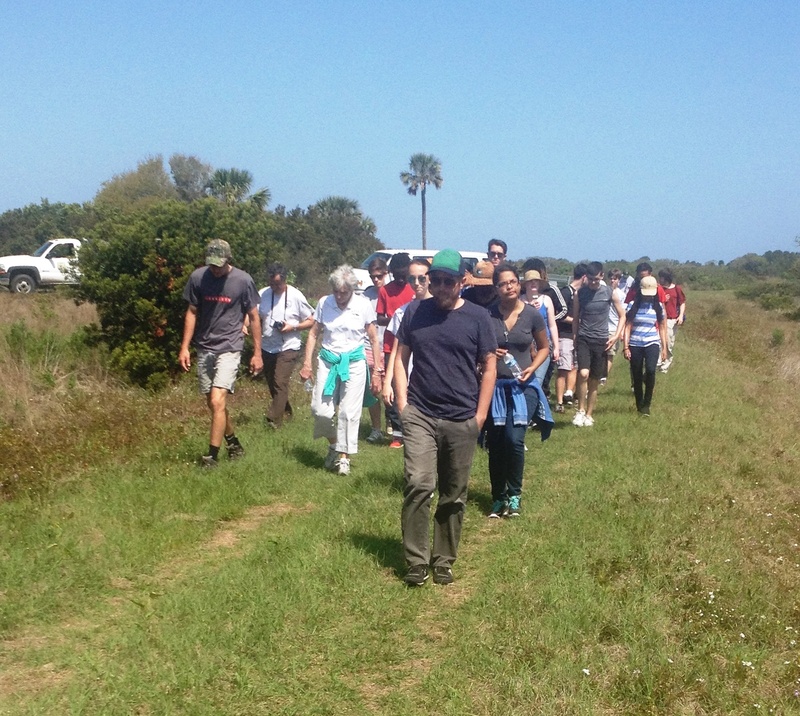 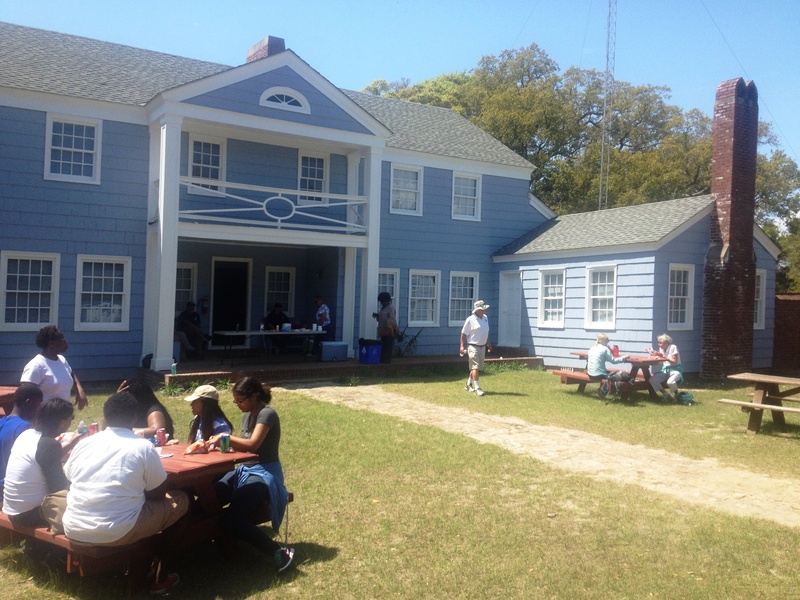 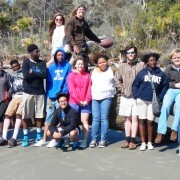 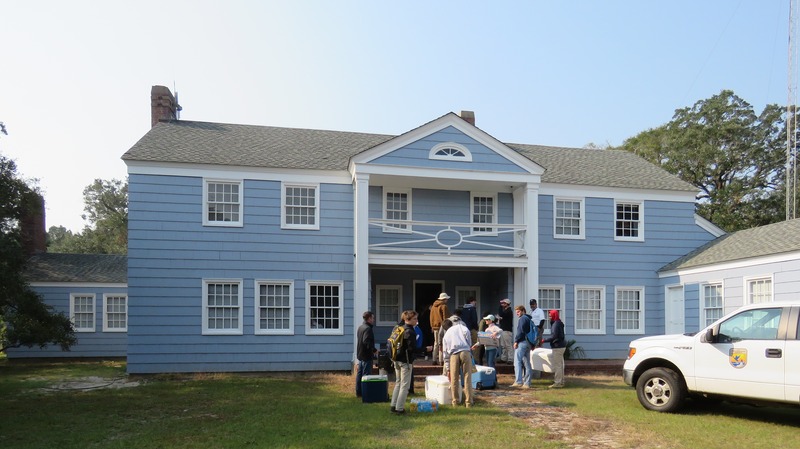 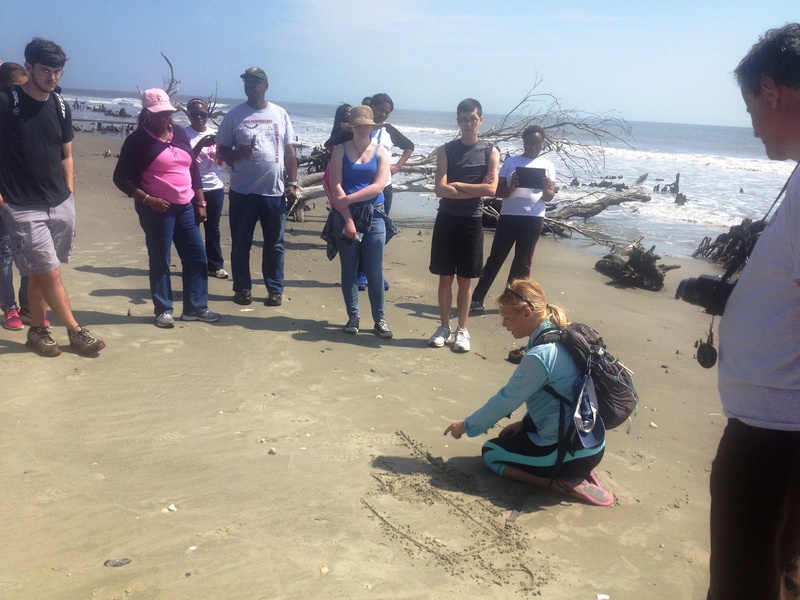 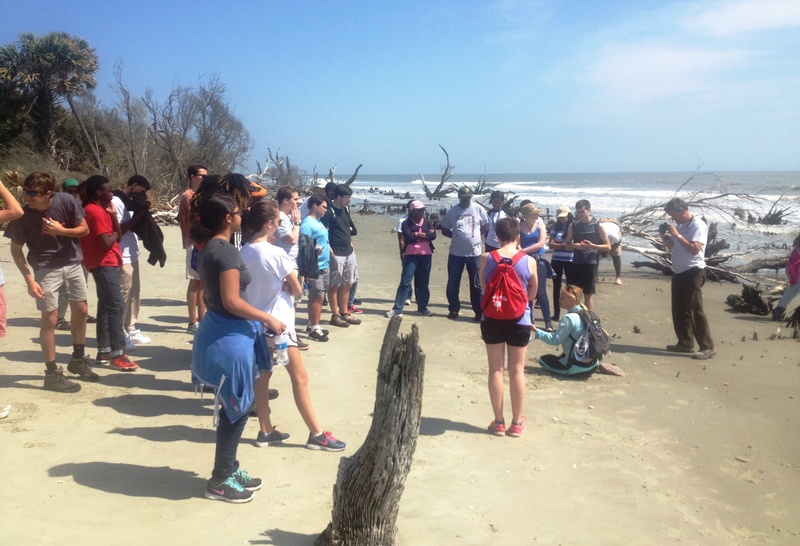 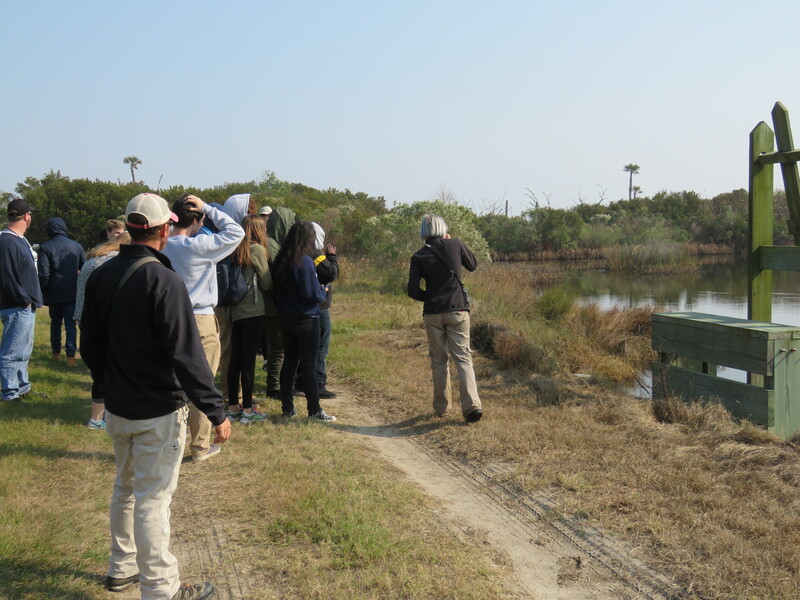 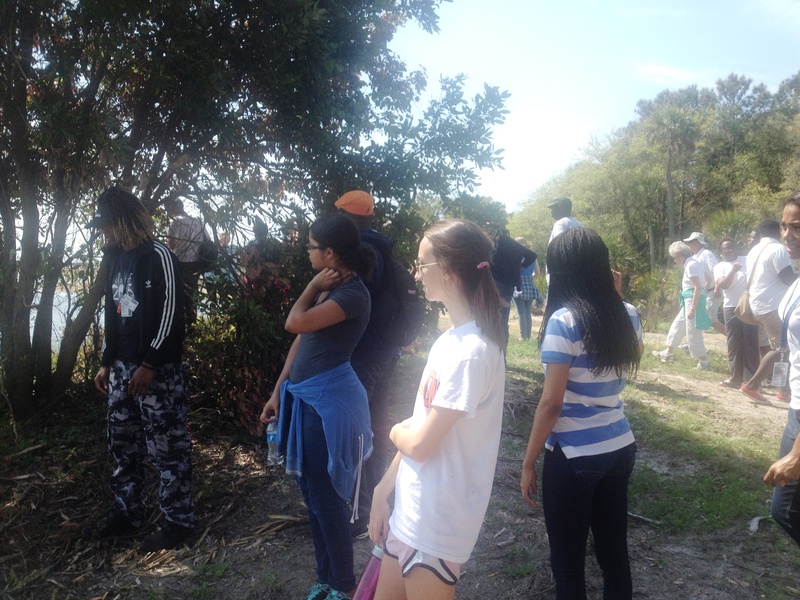 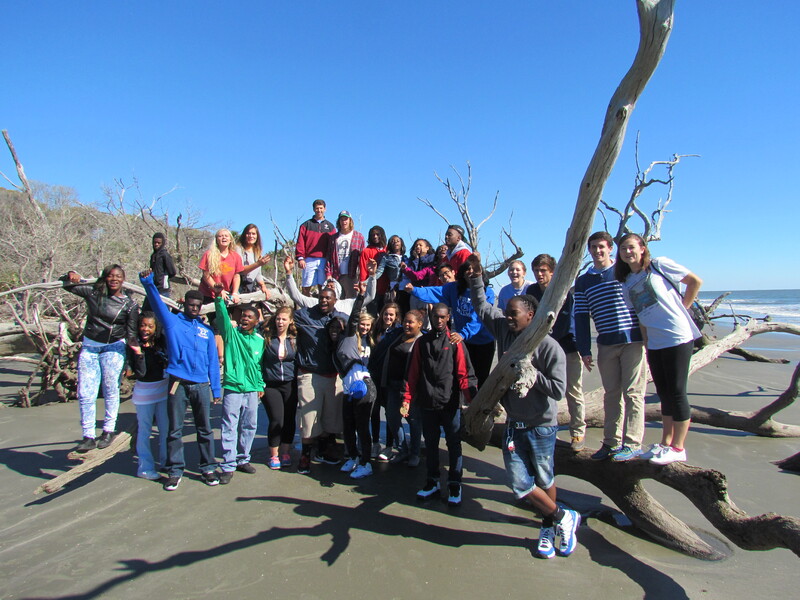 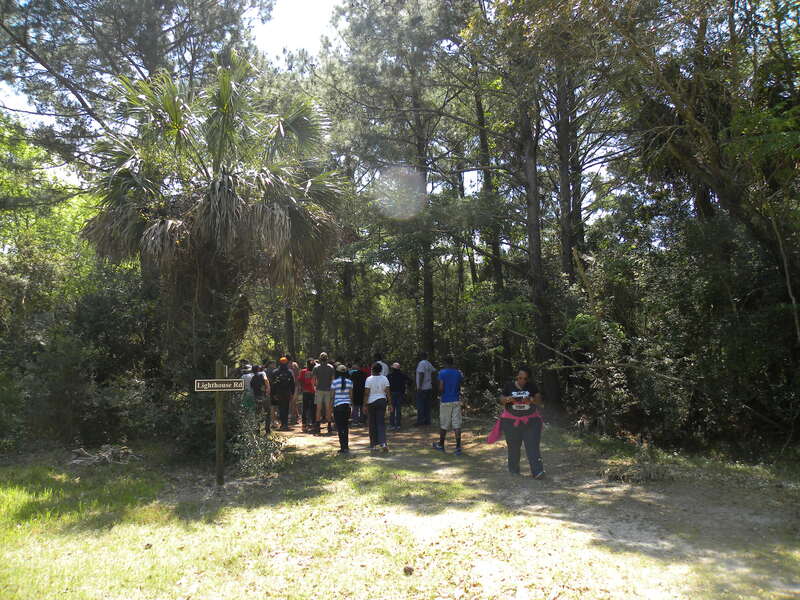 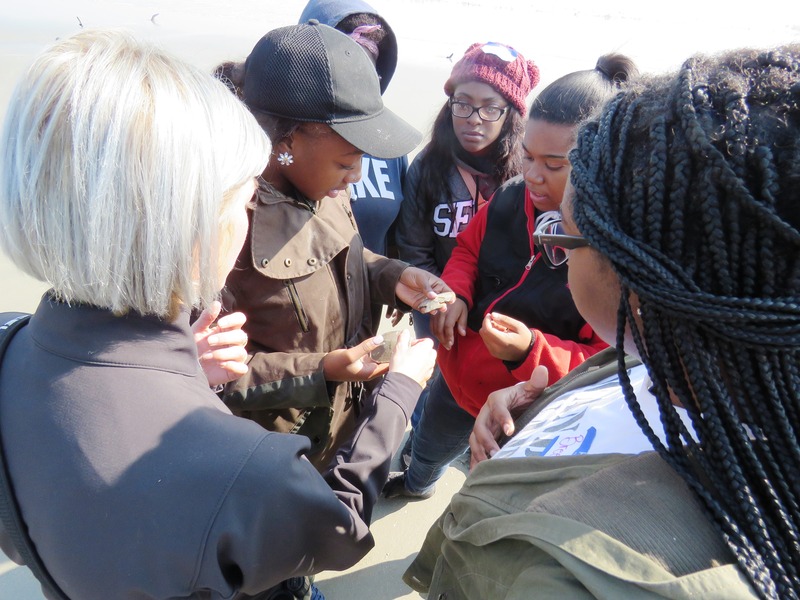 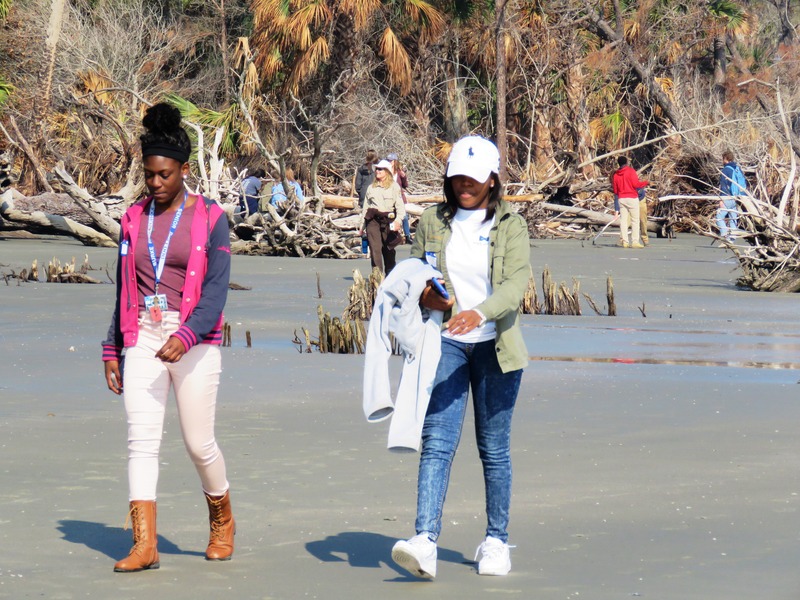 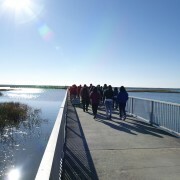 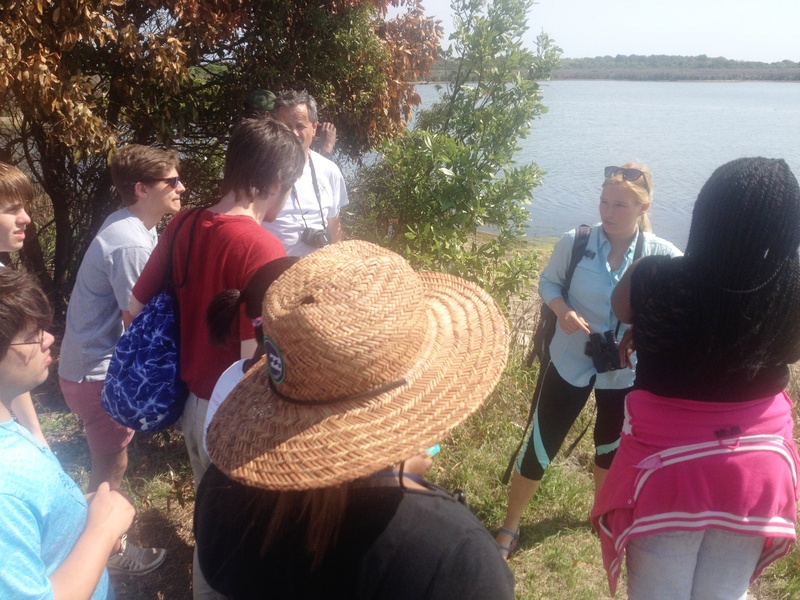 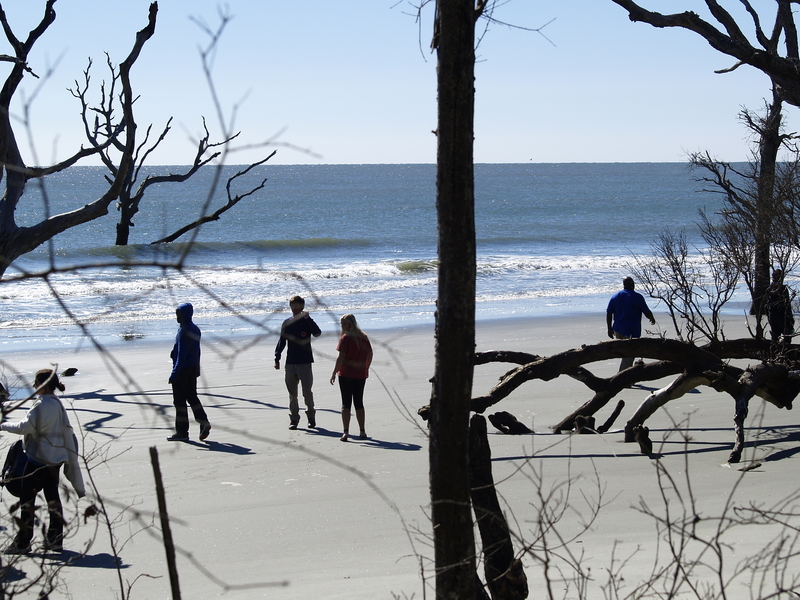 April 8, 2015 – Awendaw, SC – Thirteen students from Lincoln Middle-High School in McClellenville and thirteen students from Academic Magnet High School in North Charleston, 26 in all, enjoyed an interactive visit to beautiful Bulls Island, part of the Cape Romain National Wildlife Refuge. 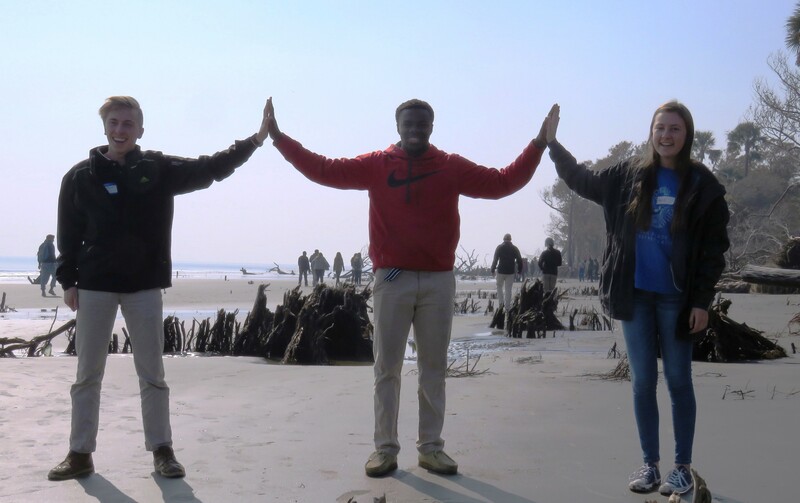 The experience was made possible through a program called “Over the Horizon” which started over 4 years ago through a Riley Institute at Furman – Diversity Leadership in Action project led by a small group of SC Diversity Leaders Initiative participants from the Lowcountry. 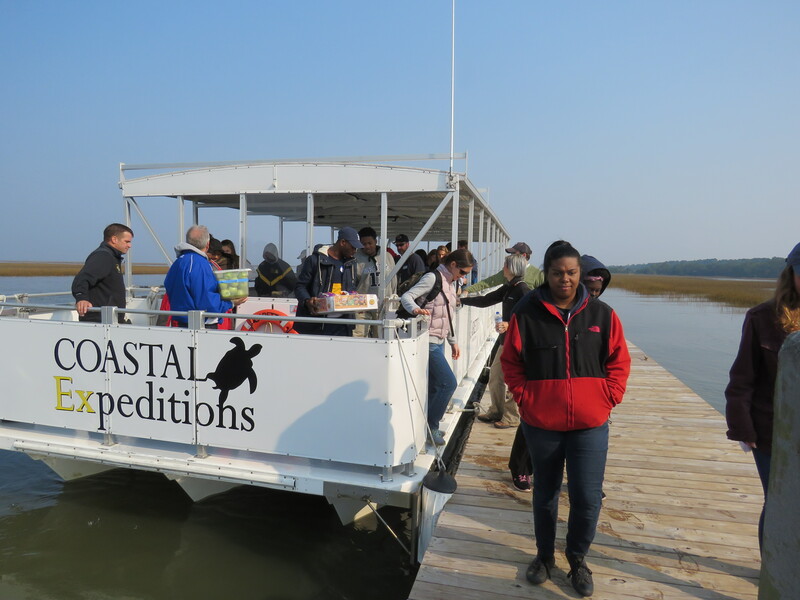 Brian Wells, a Charleston area engineer, Patricia Midgett with the Cape Romain National Wildlife Refuge, Chris Crolley with Coastal Expeditions charter service, Vera Manigault, renowned local sweetgrass basket artisan, and Michael Allen with the Gullah Geechee Culture Heritage Corridor remain involved in the project, along with many others that partnered for the initial trip to Bulls Island. 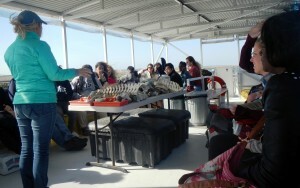 The goal of the “Over the Horizon” project is to share the value of diversity, both biodiversity and human diversity. 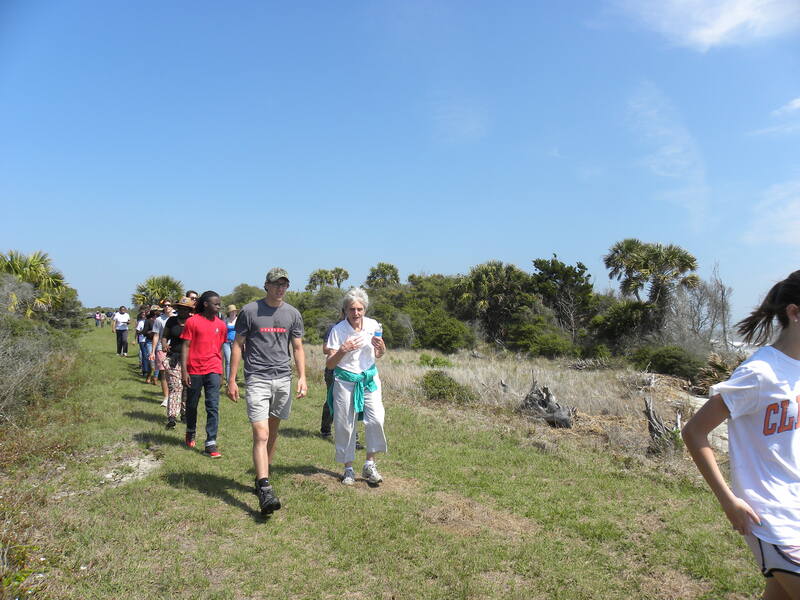 “Just as a healthy ecosystem supports diversity of wildlife, a healthy community supports a diverse group of people”, said Raye Nilius with the National Wildlife Service, one of the original organizers of the first trip. 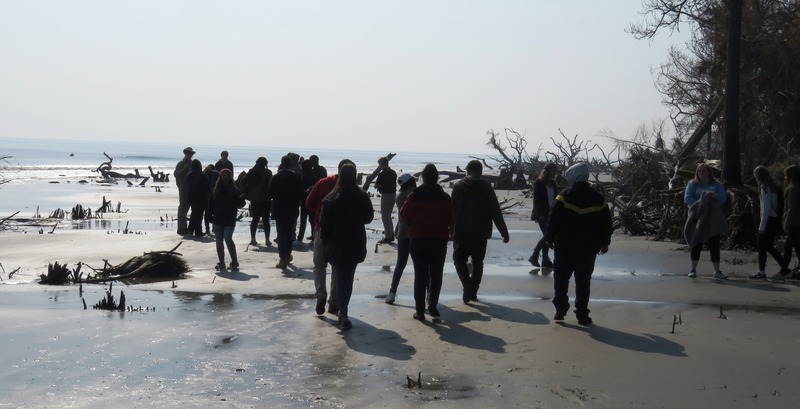 Building on the success of students from Wando and Burke High Schools participating twice a year, once in the spring and once in the fall, students from two new schools have now enjoyed their first trip. 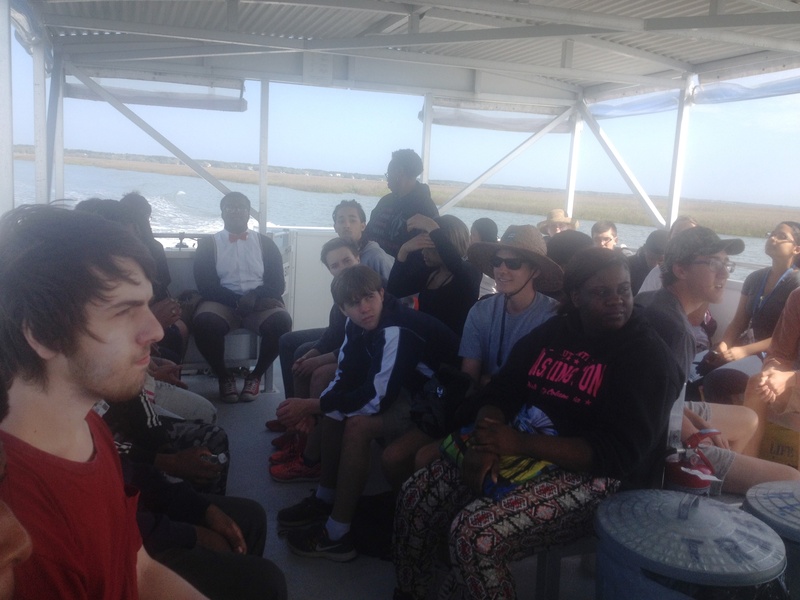 Lincoln and Academic Magnet students connected over breakfast in a classroom at Lincoln, and rode the bus together to the dock to catch the boat to Bulls Island. 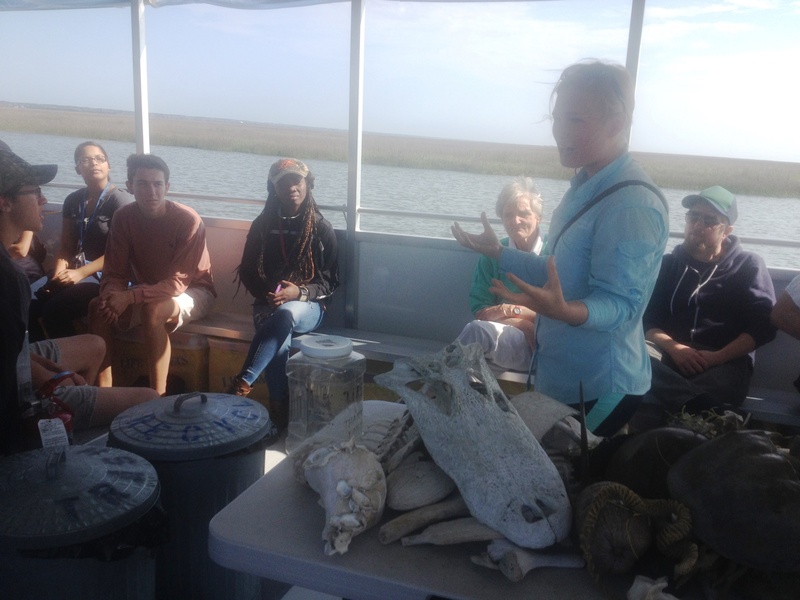 On the boat ride to Bulls Island, naturalist and Coastal Expeditions guide Olivia Melanie began the program with an introduction to the concept of biodiversity. 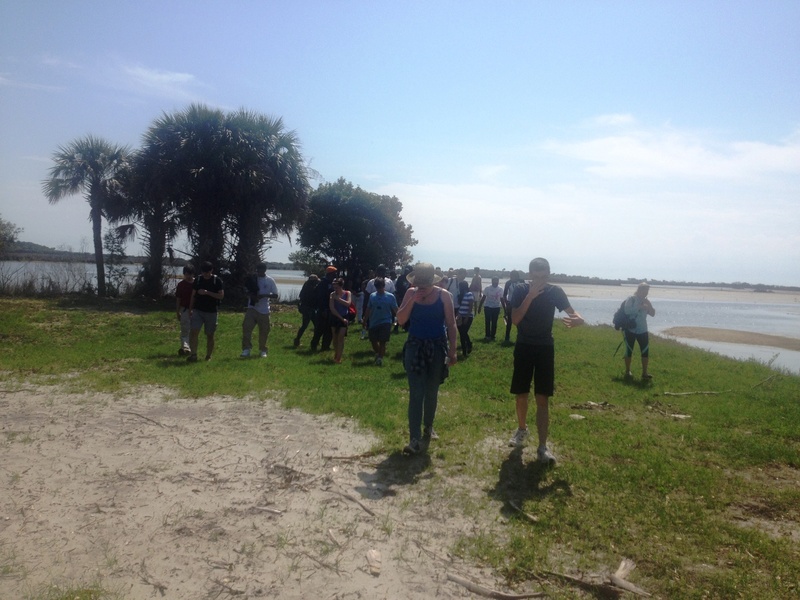 Once the boat arrived, students set off on a tour of the island’s sights led by Ms. Melanie, including historical landmarks and natural wonders. 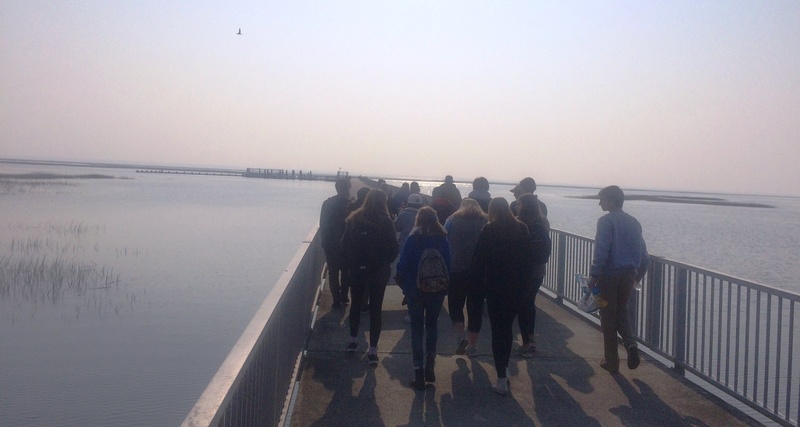 After viewing two dozen alligators swimming in a shallow pond, the students visited a monument commemorating the original English settlers of Charleston, or Charles Town as it was first named. These original Charlestonians stopped first on Bulls Island and interacted with Seewee Native Americans before sailing their boat, named Carolina up the Ashley River to start their colony on site now known as Charlestown Landing. 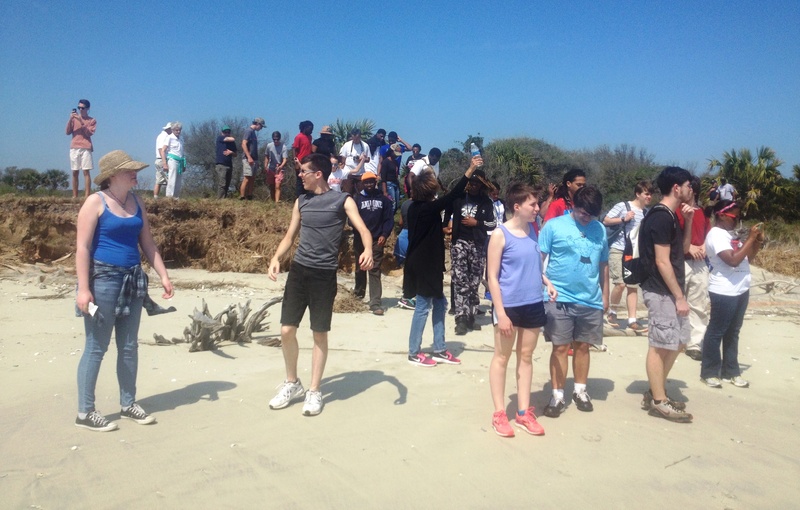 No visit to Bulls Island is complete without a walk on Boneyard beach – the student collected shells and explored this pristine beach in two places before heading back to Dominick House, the island’s sole residence, for lunch. 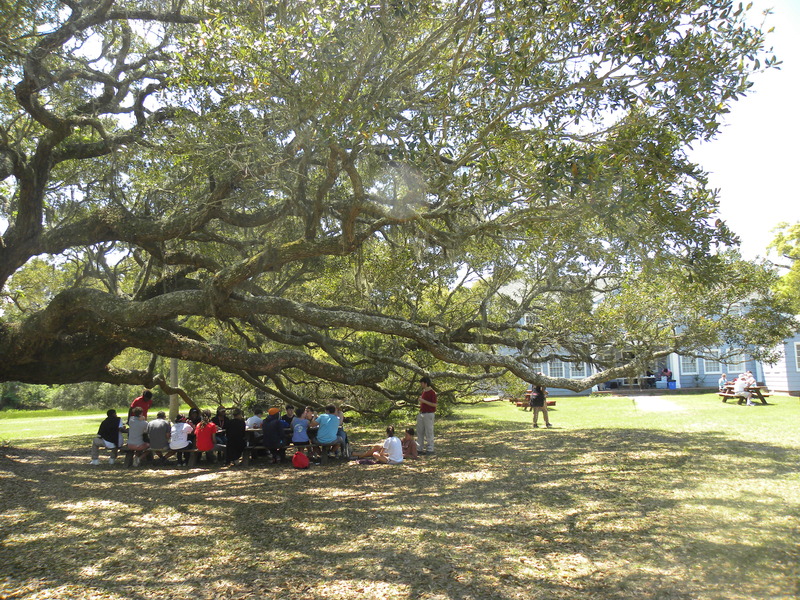 After lunch under one of the old oak trees by the Dominick House, the students enjoyed presentations from Vera Manigault and Michael Allen on the history of sweetgrass baskets and the amazing Gullah Geechee culture. 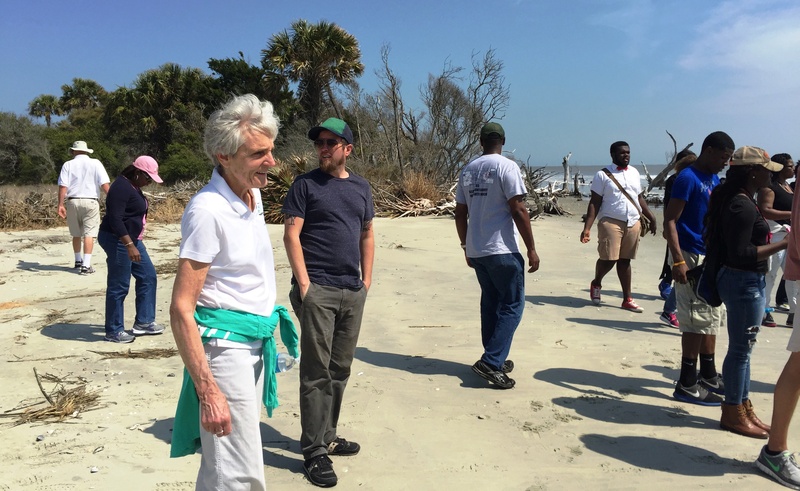 Special thanks to the terrific Natural Wildlife Service Volunteers that helped throughout the day – from driving the transport trailers to ensuring lunch was on the table when we returned from Boneyard Beach! 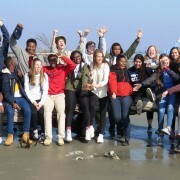 Thanks to everyone that helped expand the “Over the Horizon” program to include two new schools – the wonderful memories the students left with will be with them forever. 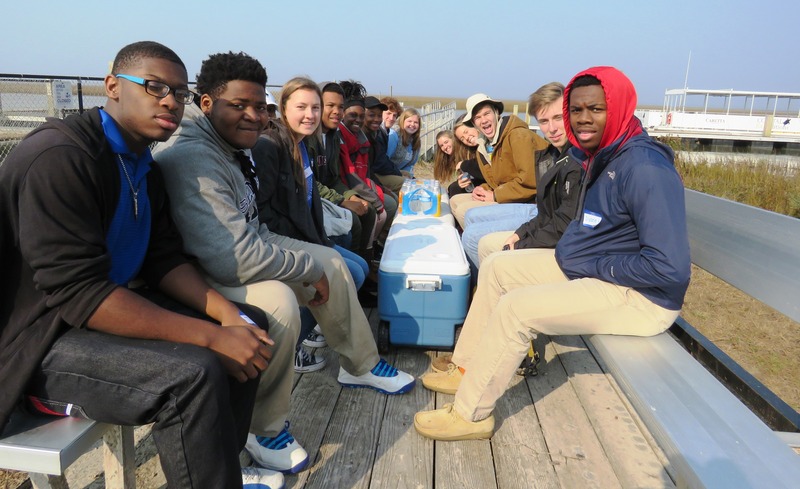 Students who had met only hours ago at Chick-fil-A for breakfast huddled together with their new friends for warmth, on a windy ferry ride to Bull’s Island. 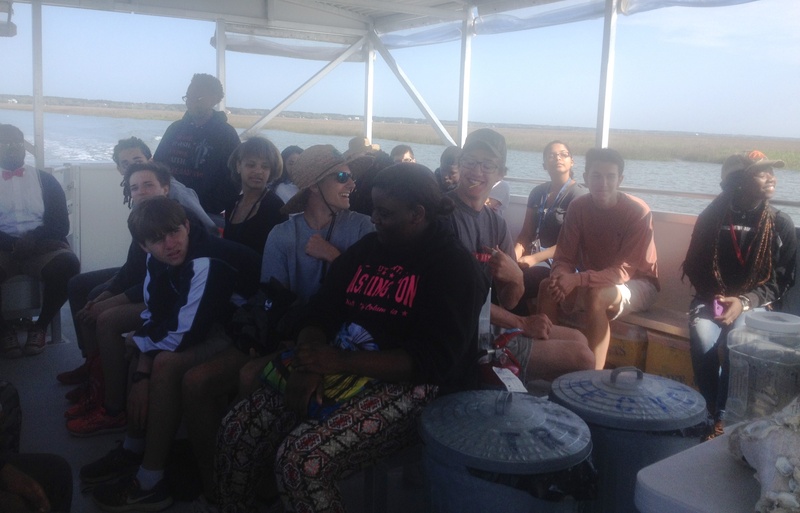 The students from Burke High School and Wando High School were on their way to the island for the Over the Horizon field study. 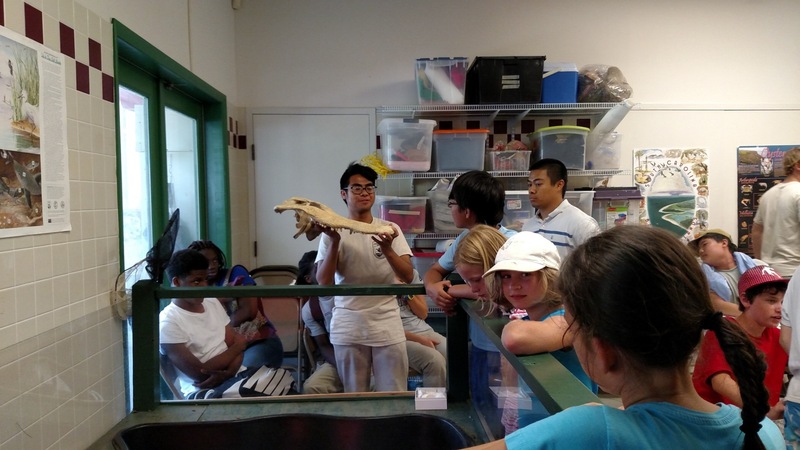 Over the Horizon is a project that teaches students the importance of cultural and biological diversity. 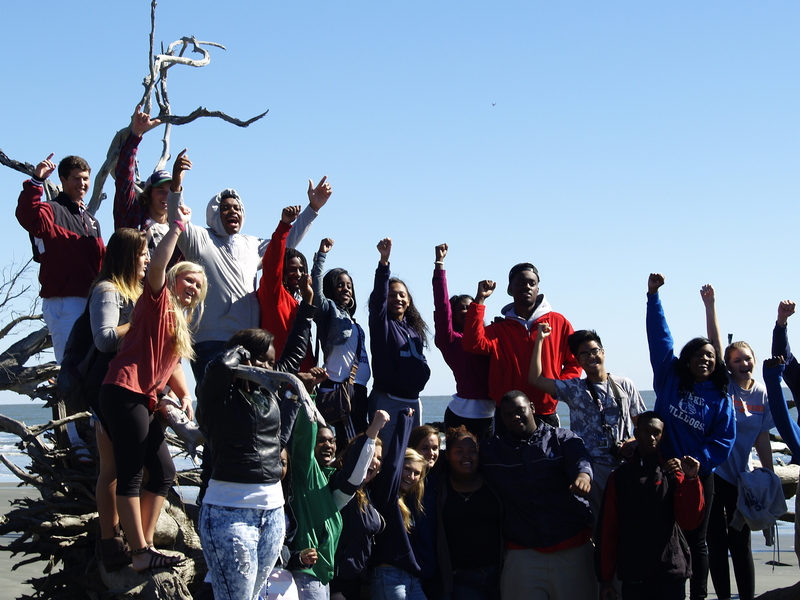 The project, now in its third year, unites students from different races, cultural backgrounds, and economic levels. 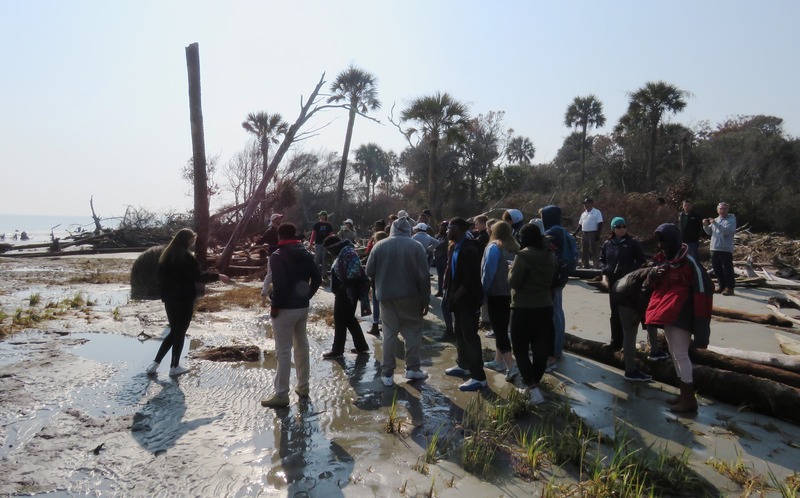 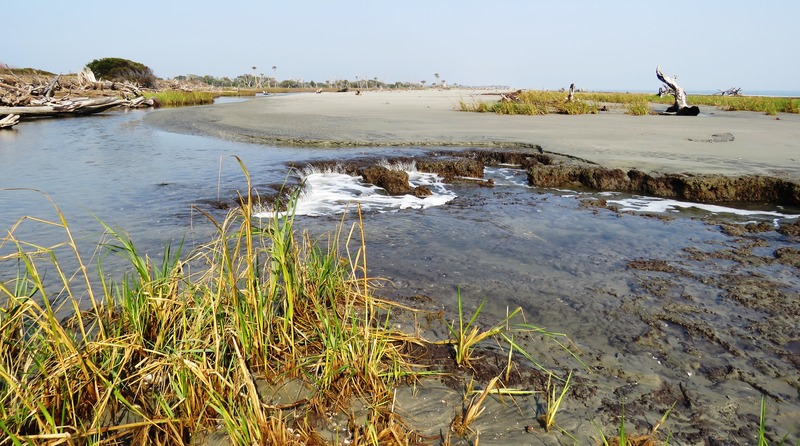 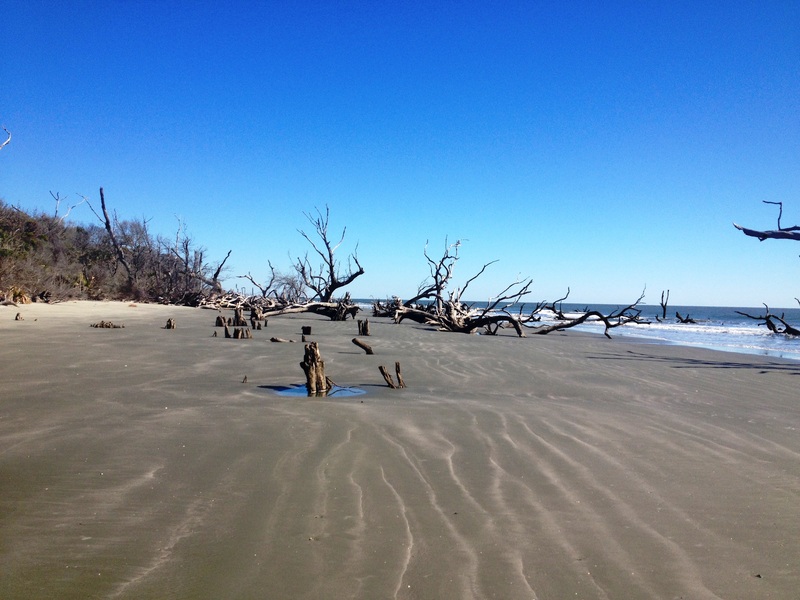 The project includes a day spent exploring and learning on Bull’s Island, a barrier island in Cape Romain National Wildlife Refuge that is known for its ecological resources . 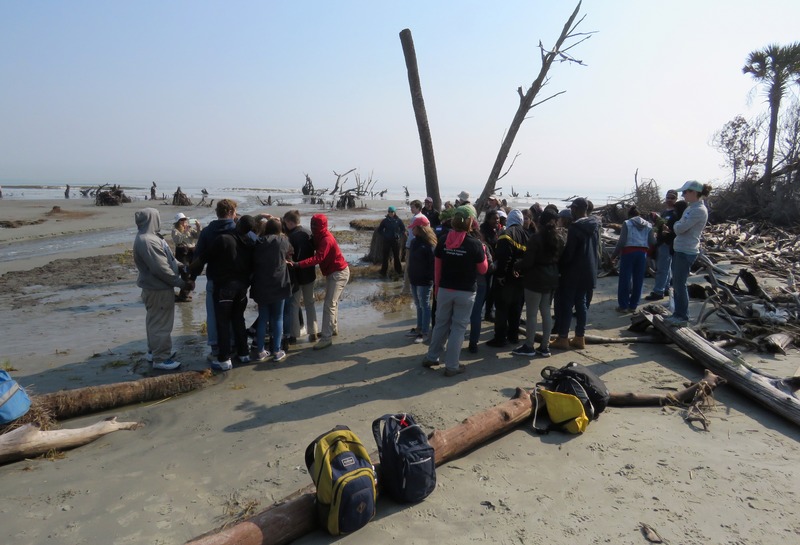 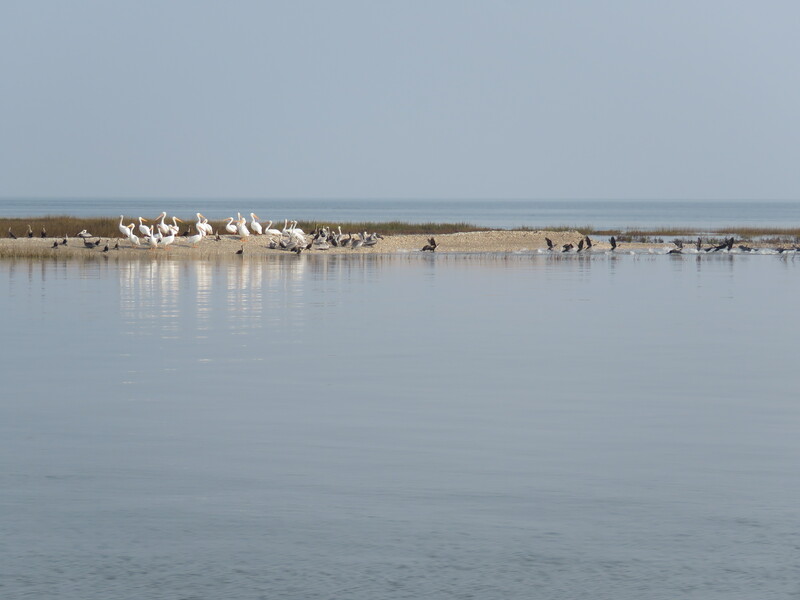 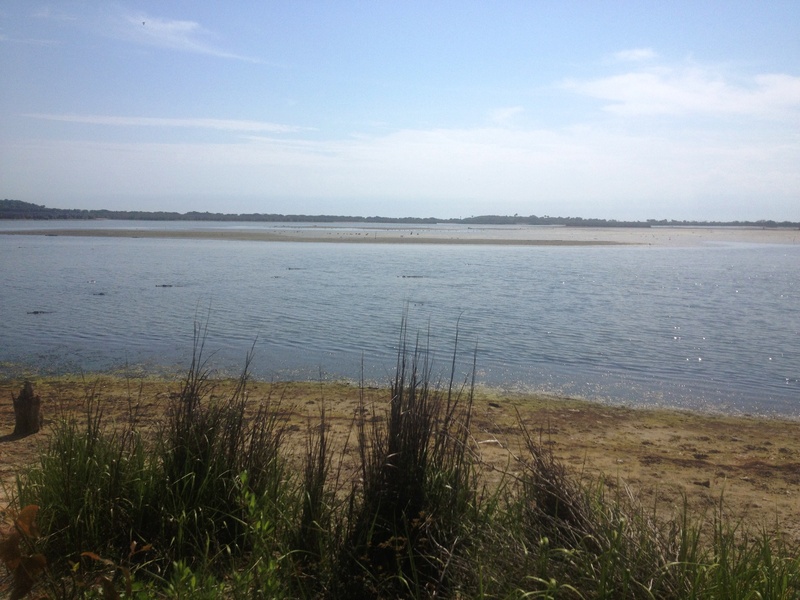 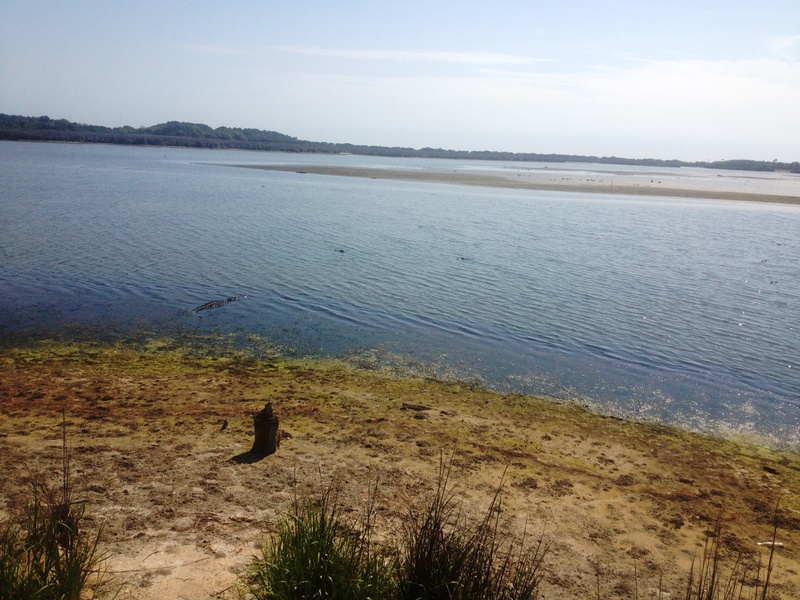 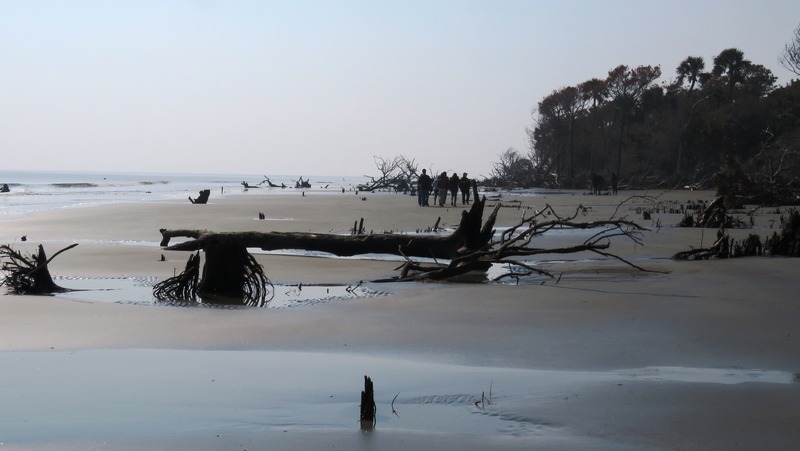 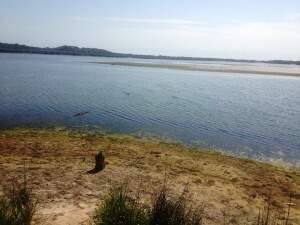 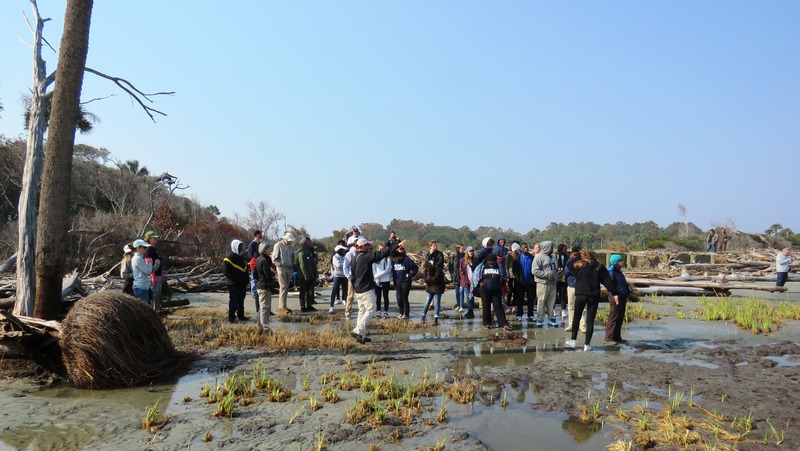 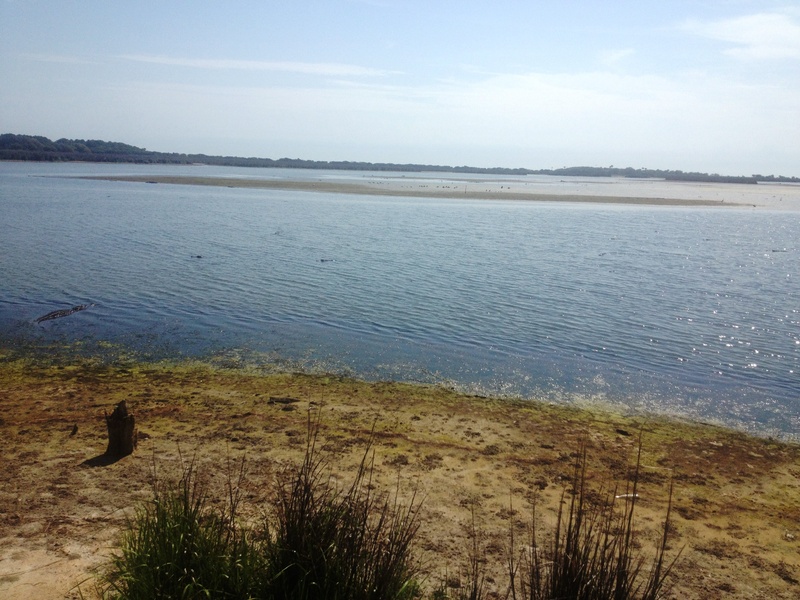 Bull’s Island is an ideal location for a diversity lesson with its variety of habitats: maritime forests, sandy beach, brackish impoundments and salt marsh. 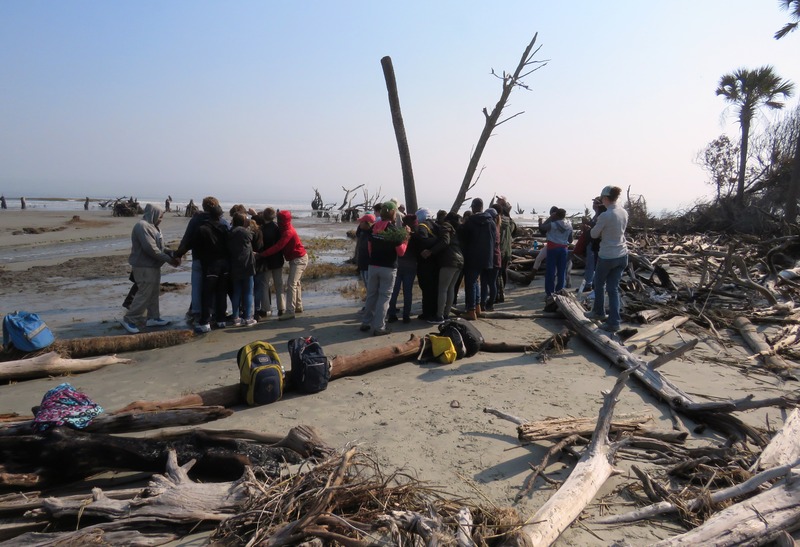 Within the diverse ecosystems of Bull’s Island are an abundance of wildlife and plants which co-exist and depend on each other for survival. 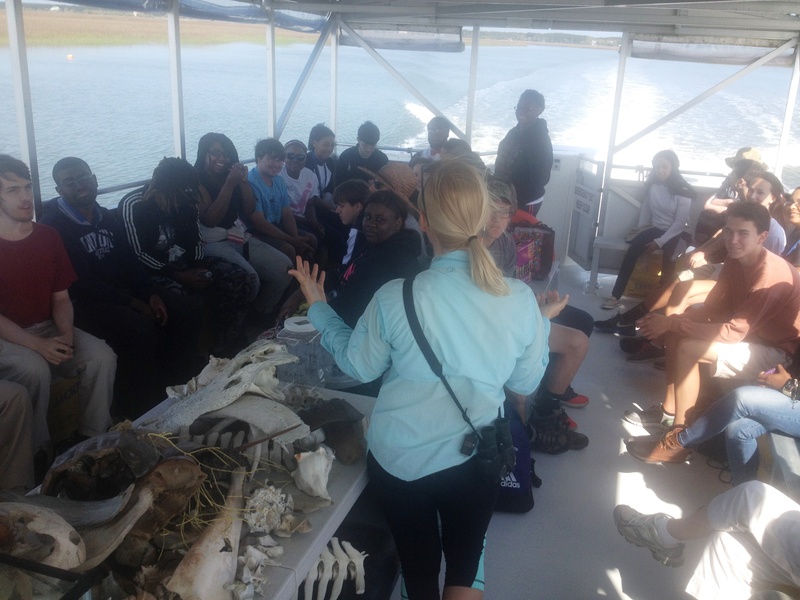 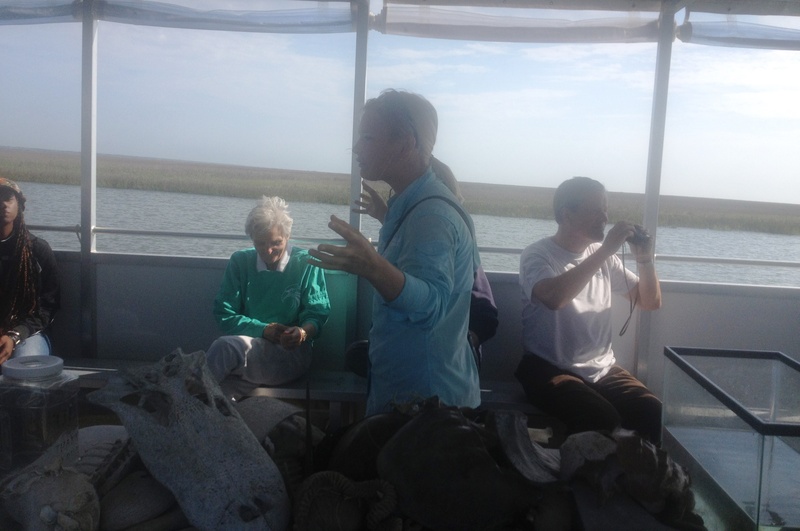 Gates Roll, a naturalist for Coastal Expeditions, led the students through the different ecosystems, sharing with them the abundant natural and cultural history of the island. 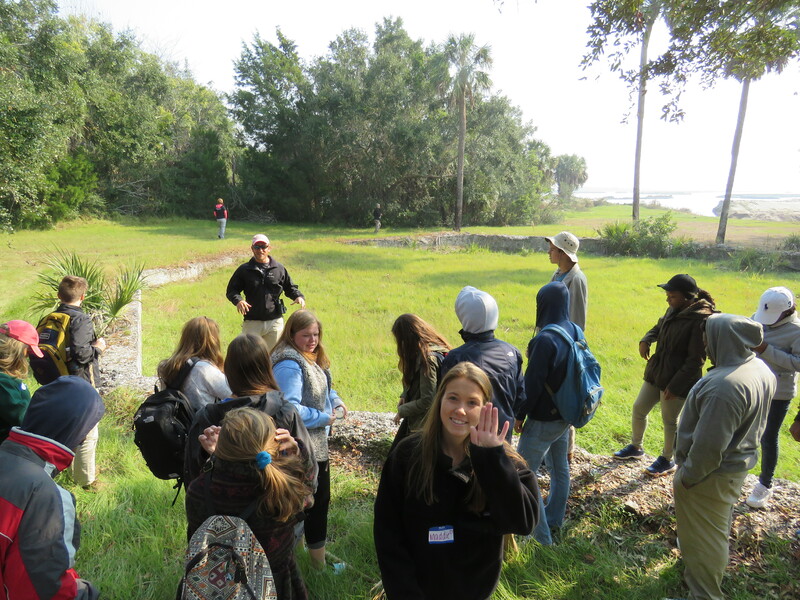 The first stop was at a barely visible foundation of the Martello Tower, where Gates told students about the Sewee Indians who first inhabited the area, the English Settlers who landed and later claimed the island and, that the tower was used as a lookout for pirates and also served during the revolutionary and civil wars. 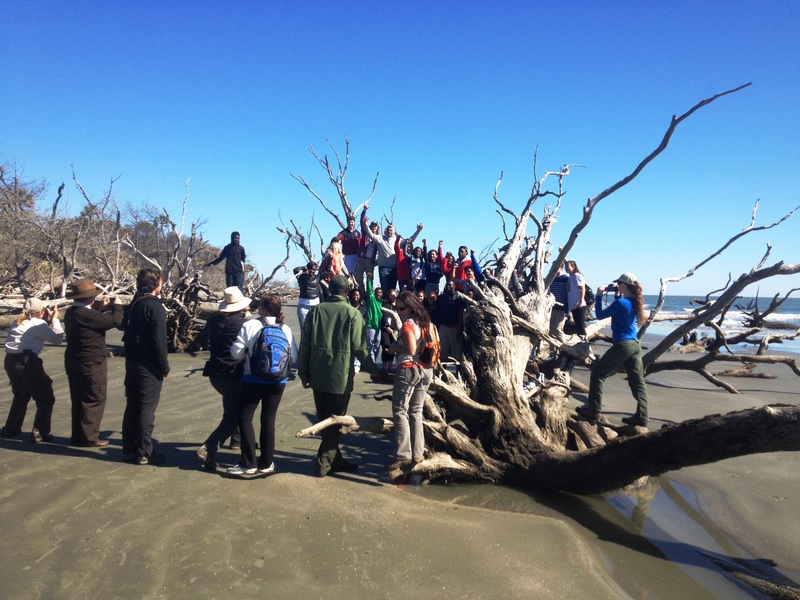 Next was a visit to Boneyard Beach, where they posed for a group photo with their new friends on a fallen sun-bleached tree. 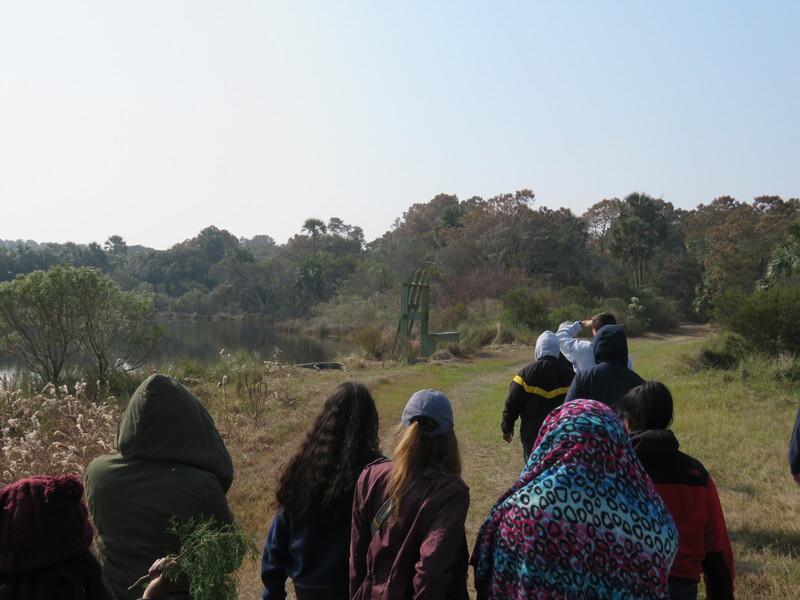 Students passed from the beach, through the maritime forest, to the marsh in mere minutes and learned that the diversity of the ecosystems is what creates a healthy natural community. 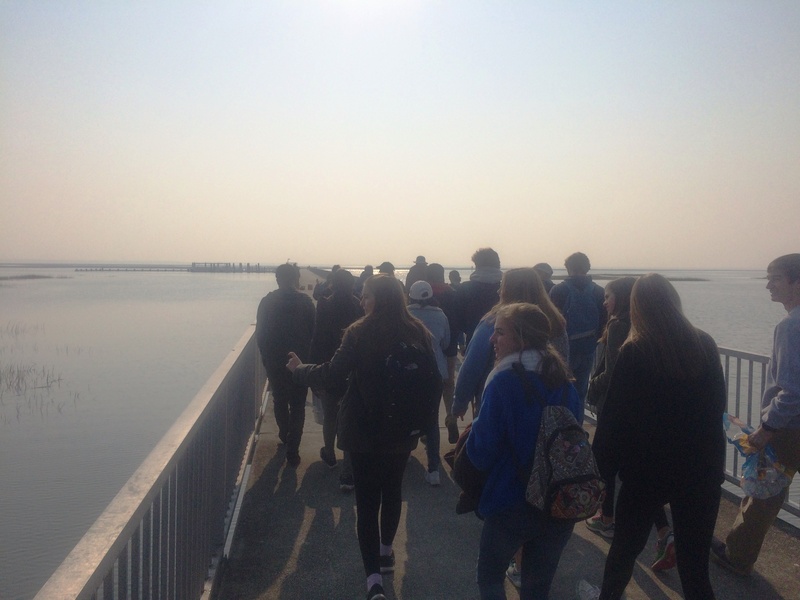 In addition, they learned that, similarly, in a society where two or more different types of cultures come together, there you will also find a stronger, healthier community. 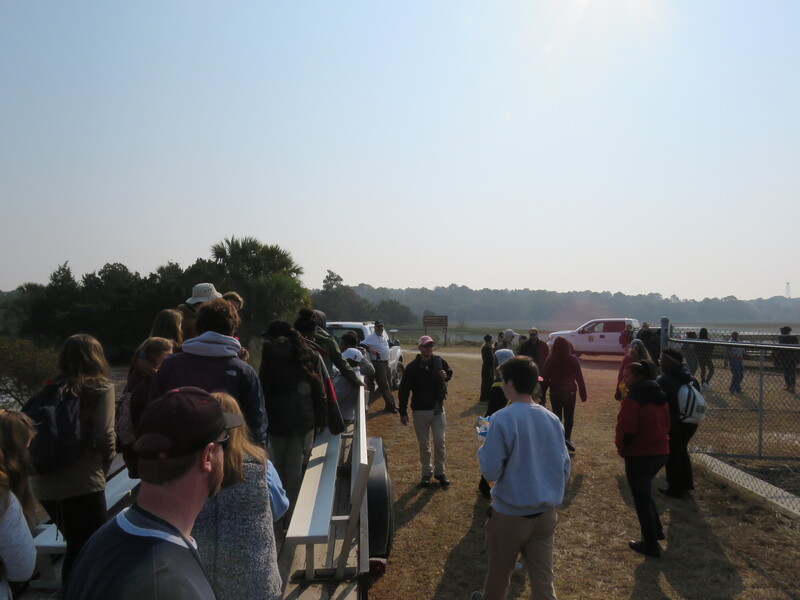 Back on the trailers, students discussed hobbies, jobs, and which colleges they were going to attend, realizing that despite any differences, there were many more similarities. 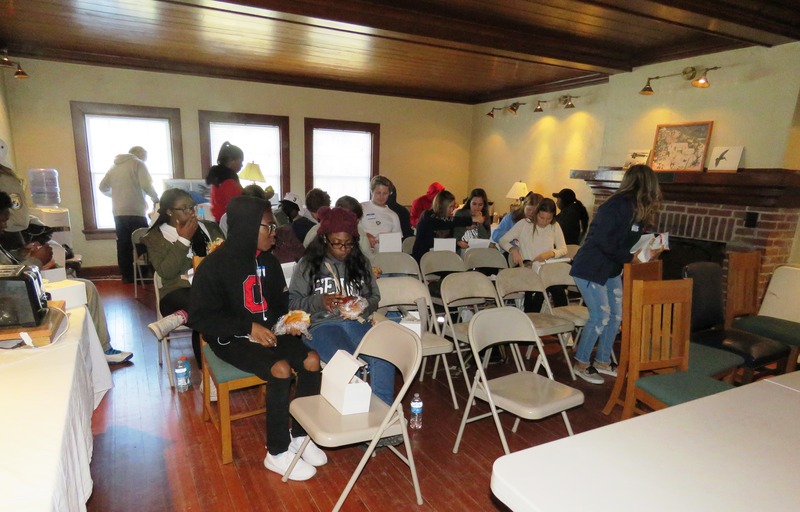 At the Dominick House, conversation flowed effortlessly as they shared food from their lunches, played ball, braided each other’s hair and did yoga. 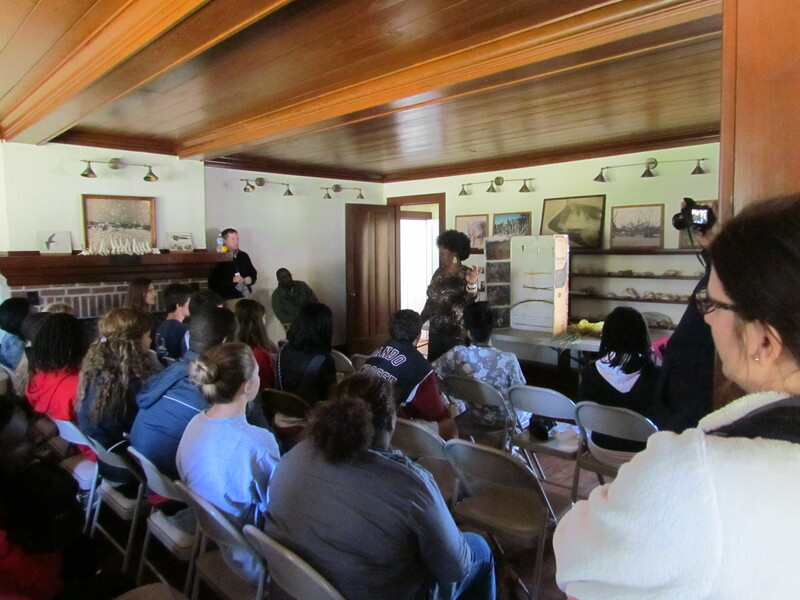 The final program of the day was a presentation by Vera Manigault, sweetgrass basketry artisan and Gullah Geechee historian. 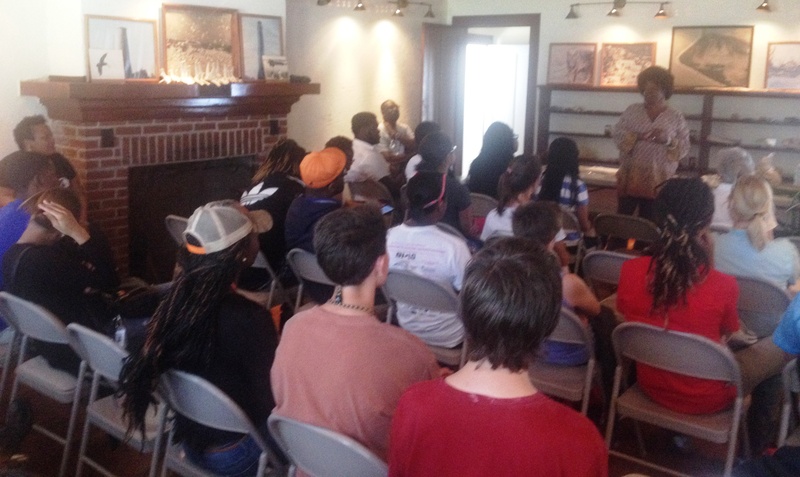 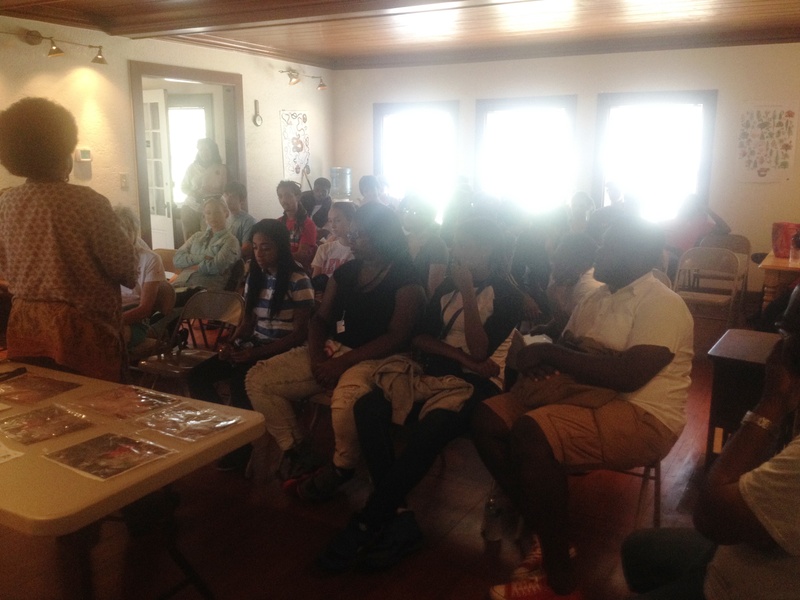 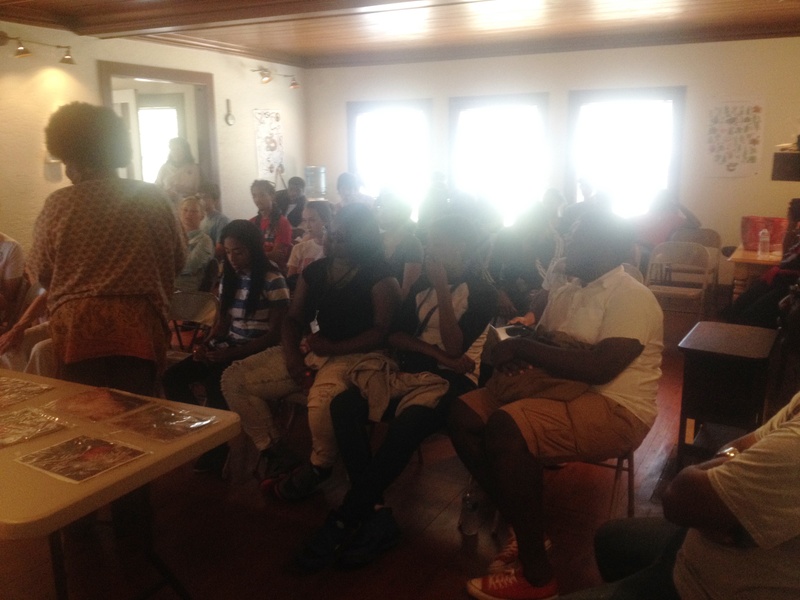 Students learned the history of sweetgrass basket sewing and its significance to the Gullah Geechee culture. 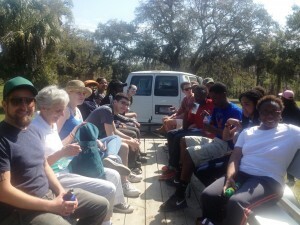 They were even treated to a conversation in Gullah between Vera and Burke student, Aisha. 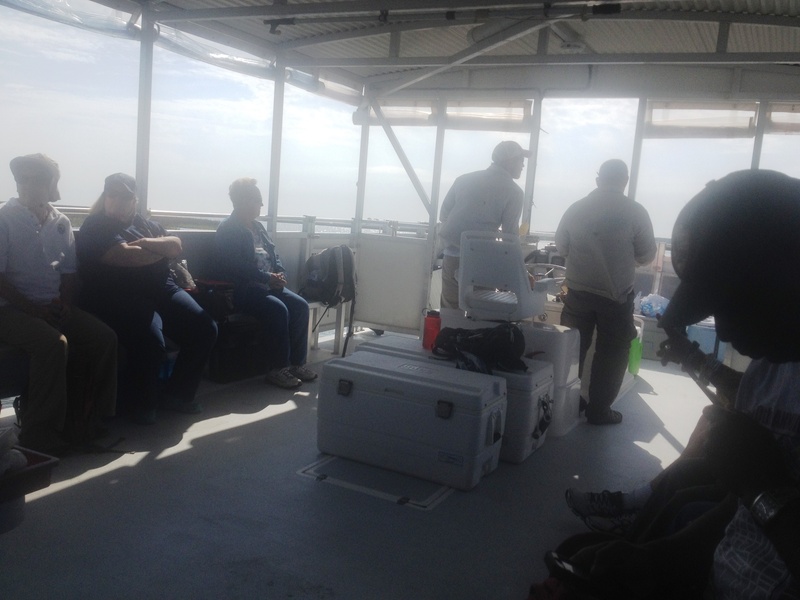 On the ferry ride back, new friends took photos and exchanged contact information. 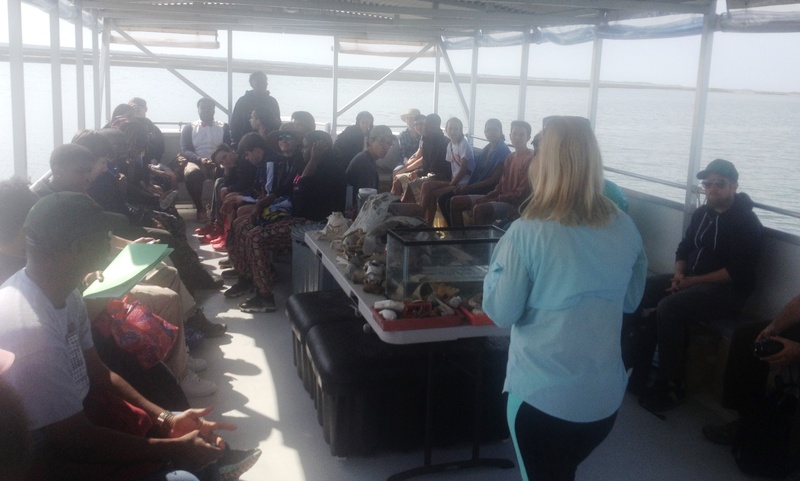 The students gave an enthusiastic “Oh Yea!” when asked if they had had an enjoyable Over the Horizon experience. 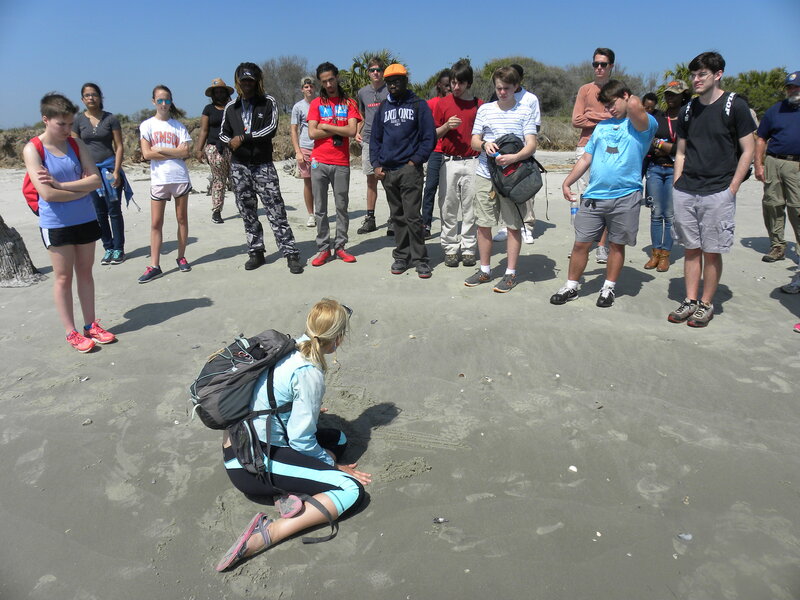 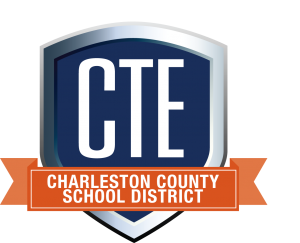 Cape Romain National Wildlife Refuge, Coastal Expeditions and the Charleston County School District are pleased to announce the expansion of Over the Horizon this year to Lincoln Middle-High School and Academic Magnet High School. 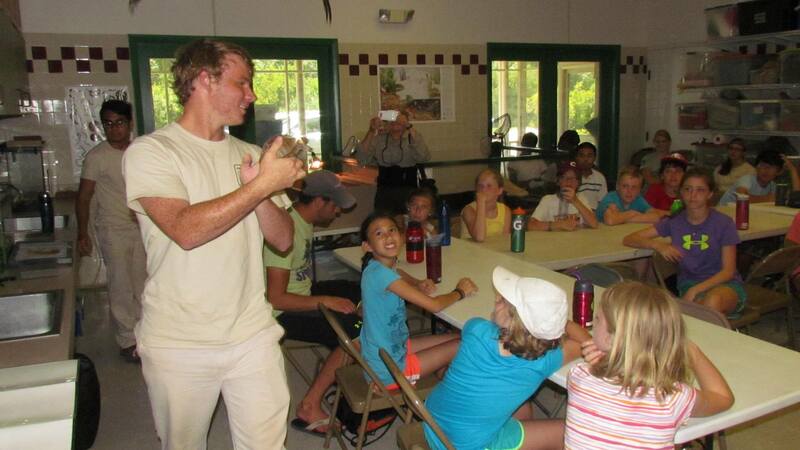 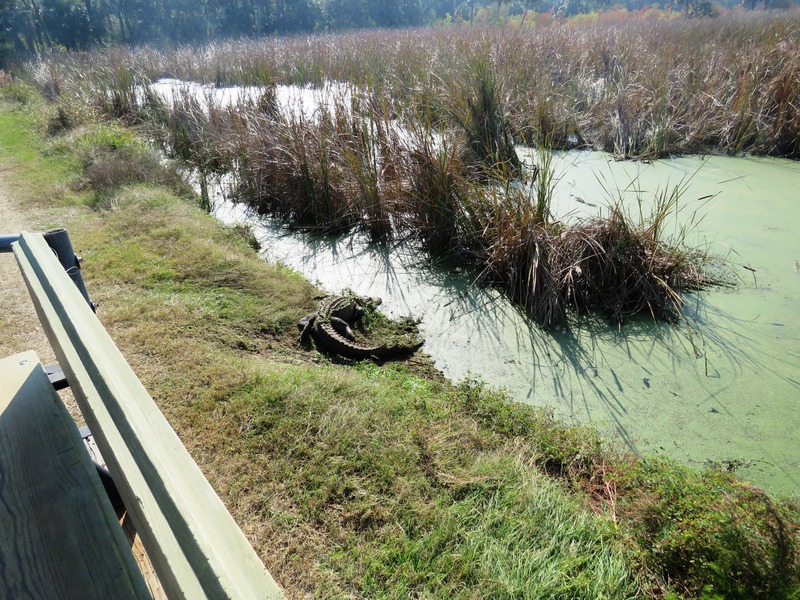 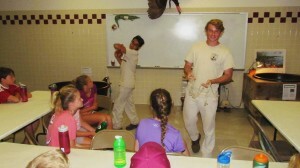 Story by Katie Rittenhouse, Student Conservation Association Intern. 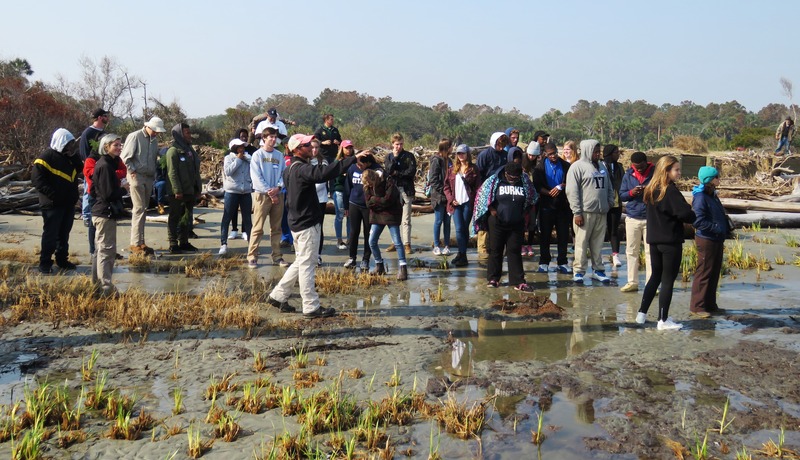 October 22, 2014 – How do you get teenagers from two different sides of the economic spectrum to spend a whole day together chatting about everything from the flight patterns of wood storks to the technology of rice plantations? 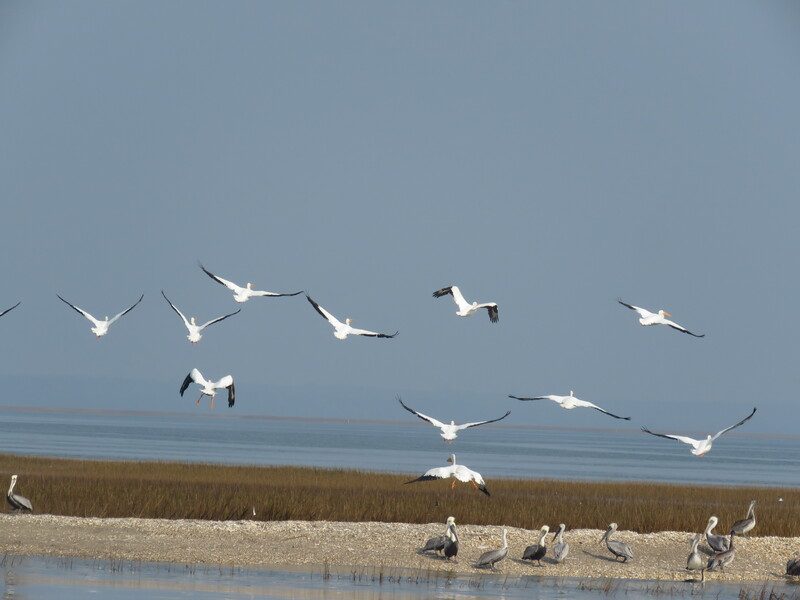 Take them on a trip Over the Horizon. 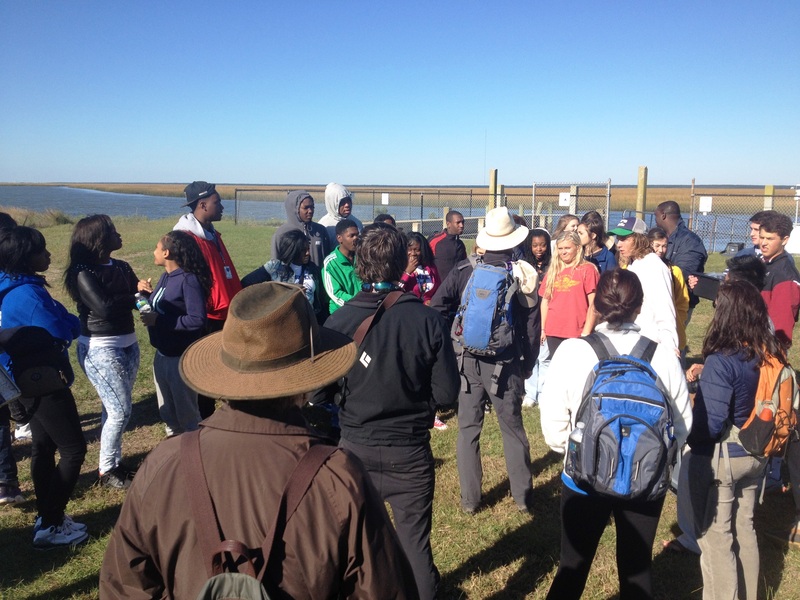 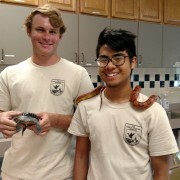 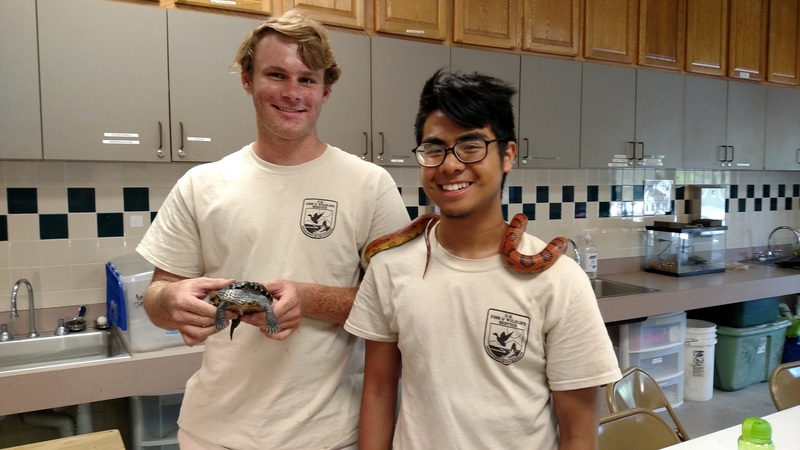 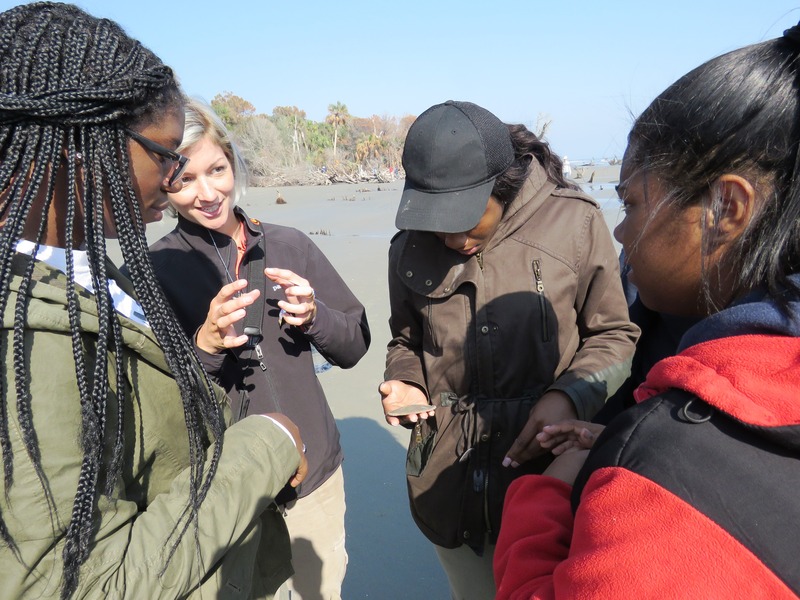 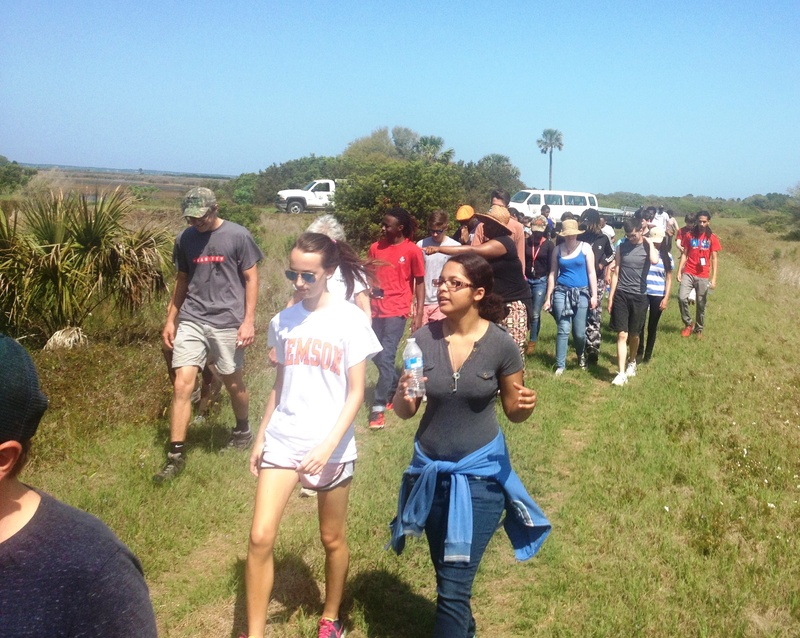 A program hosted by Cape Romain National Wildlife Refuge, Over the Horizon brings together students from the Charleston area for a day of diversity— both biological and cultural. 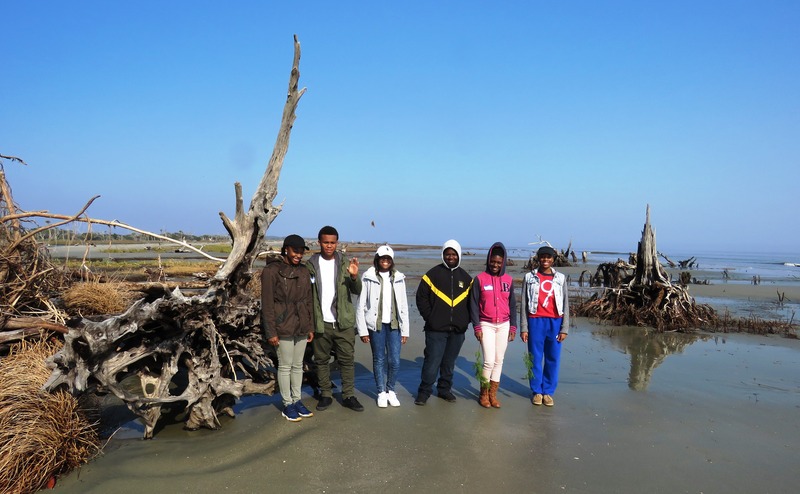 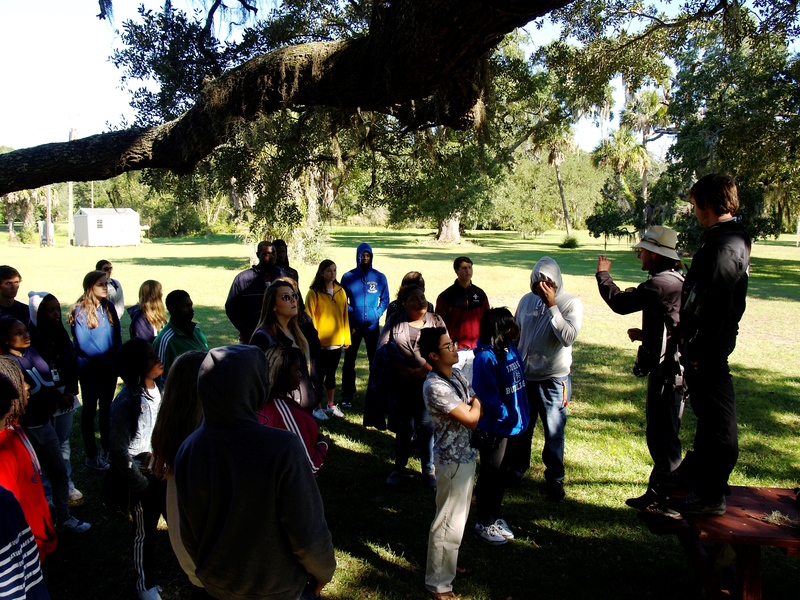 The rich natural and cultural histories of the Lowcountry connect students to their past, present, and future. 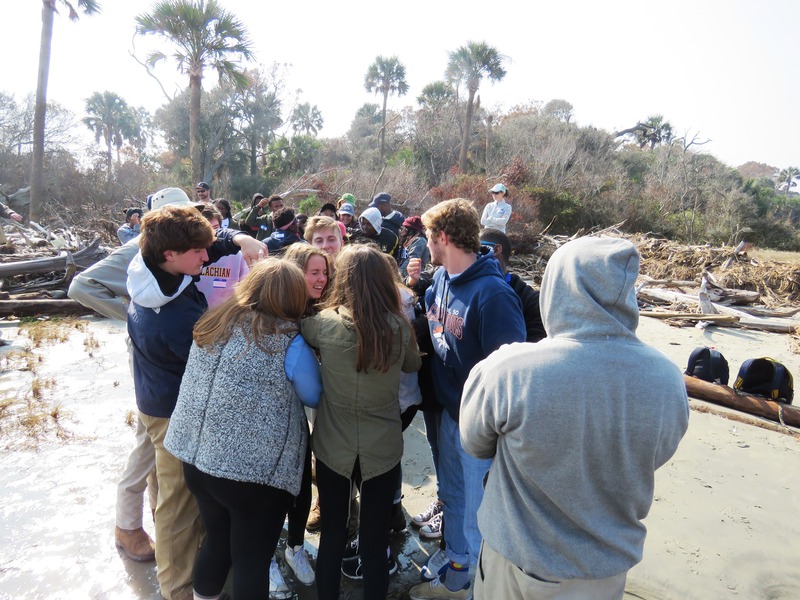 For the third year in a row 15 students from Burke High School in Downtown Charleston and 15 students from Wando High School in Mt. Pleasant shared the experience. Most students had never been to Cape Romain, never seeing up close the unique habitat right in their backyard. 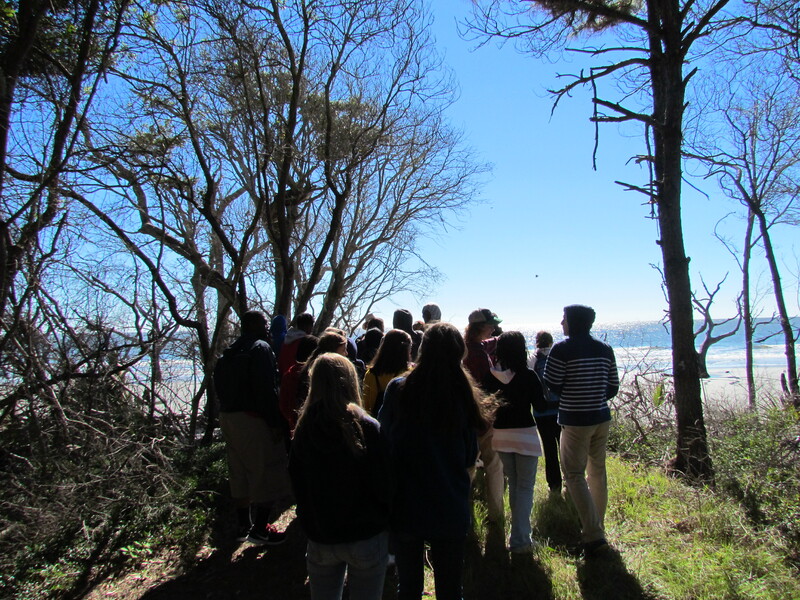 Over the Horizon provided students not only a new experience but a new perspective on the public lands which they will soon be entrusted to help protect. 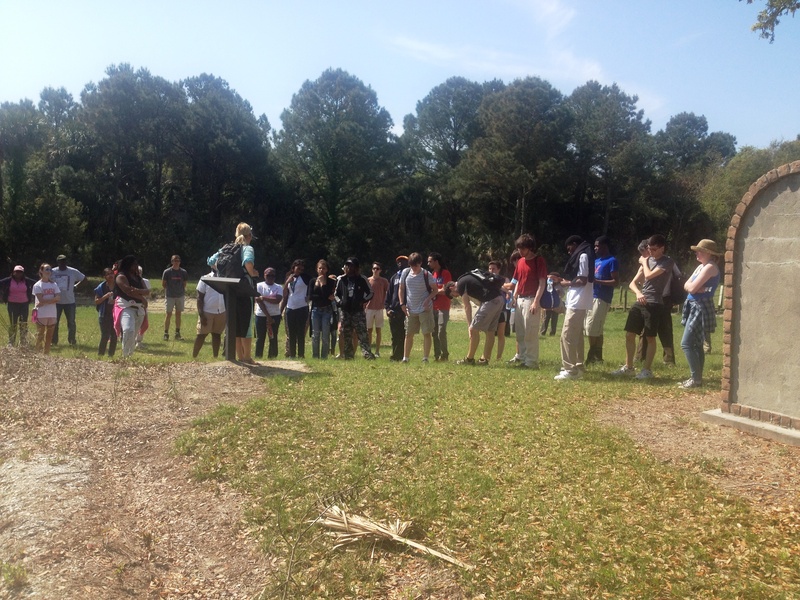 Students learned the importance of the surrounding area and the importance of taking ownership of the land and history. 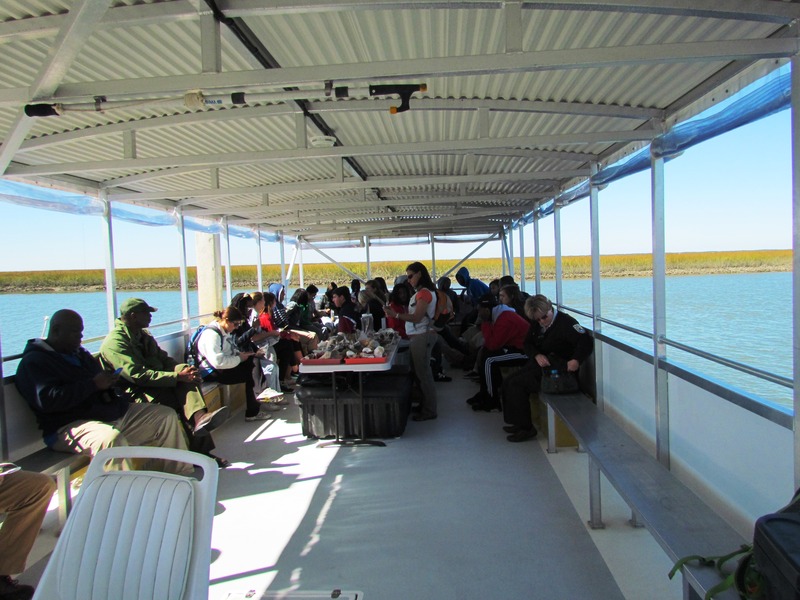 The day began with a boat ride from Garris Landing to Bulls Island. 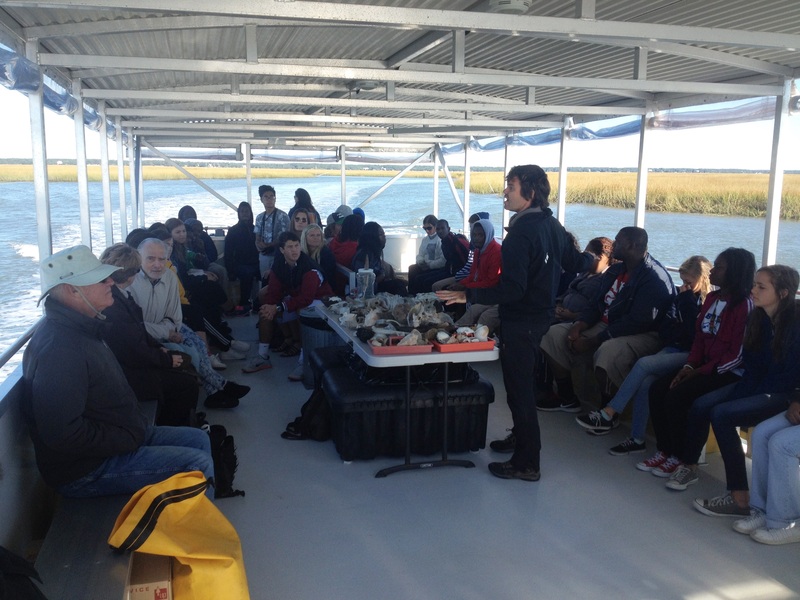 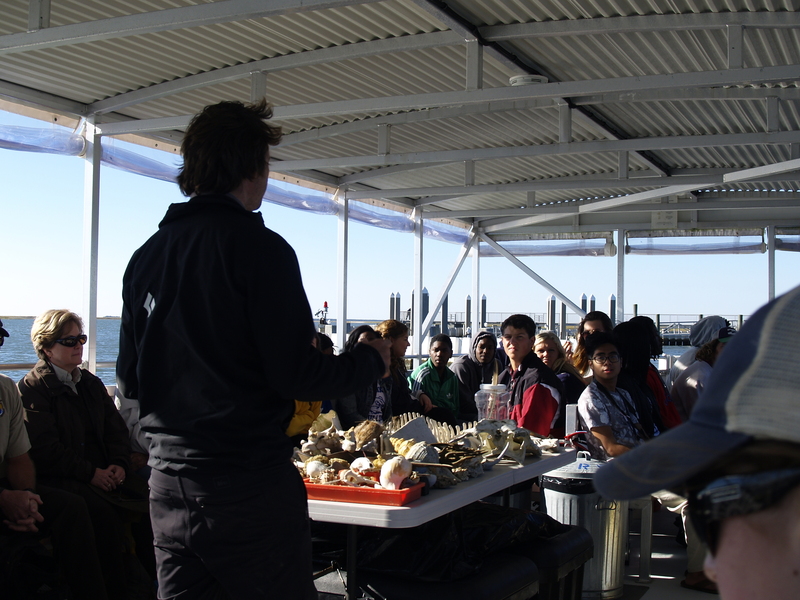 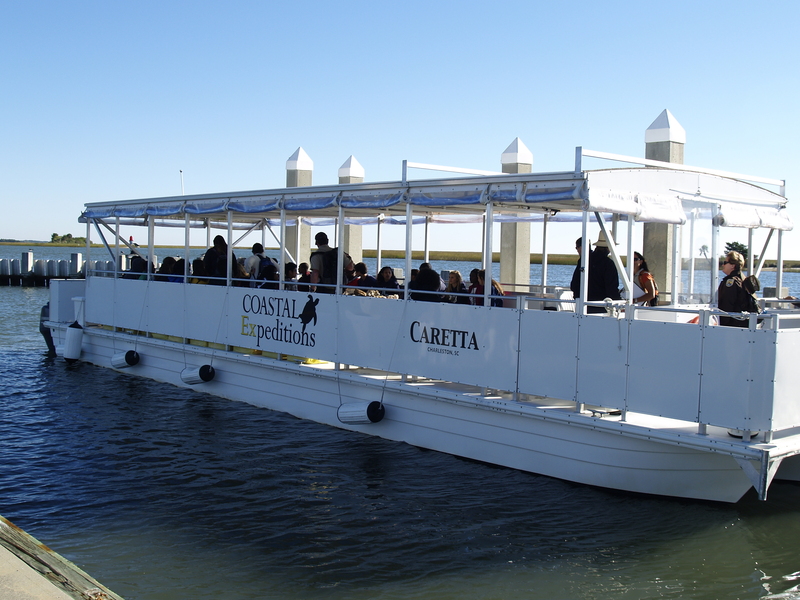 Guided through the intercoastal waterway by Chris Crolley and Gates Roll of Coastal Expeditions, students, teachers, and volunteers viewed the vast chordgrass salt marshes and abundant bird life, and discussed the importance of biodiversity in maintaining healthy ecosystems. 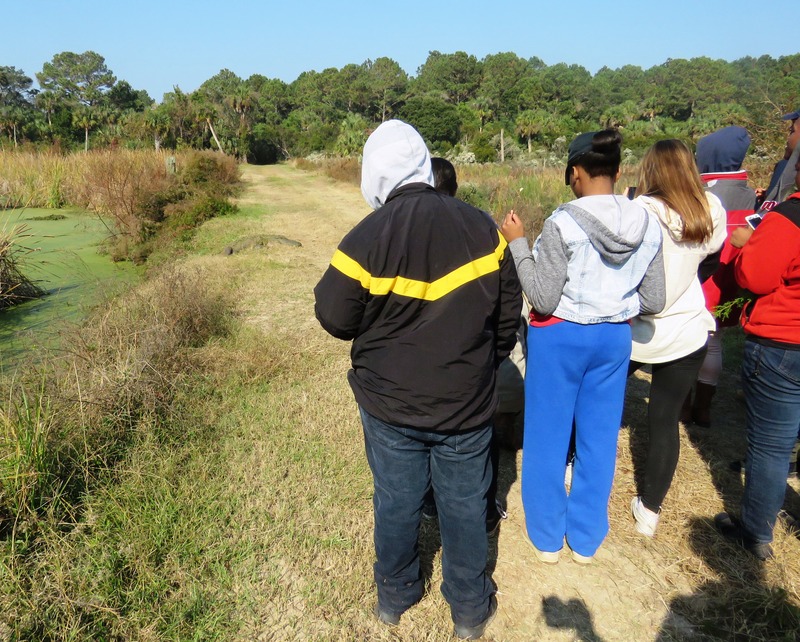 Upon landing on Bulls Island, students spent the morning touring the maritime forest, freshwater marshes, and pristine beaches, spotting egrets, fox squirrels, and— of course— alligators along the way. 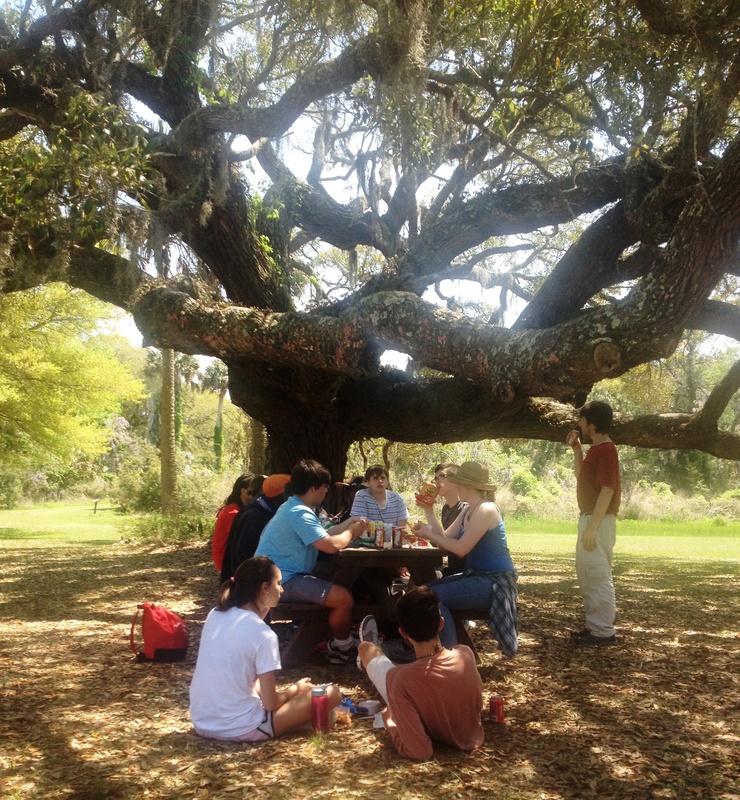 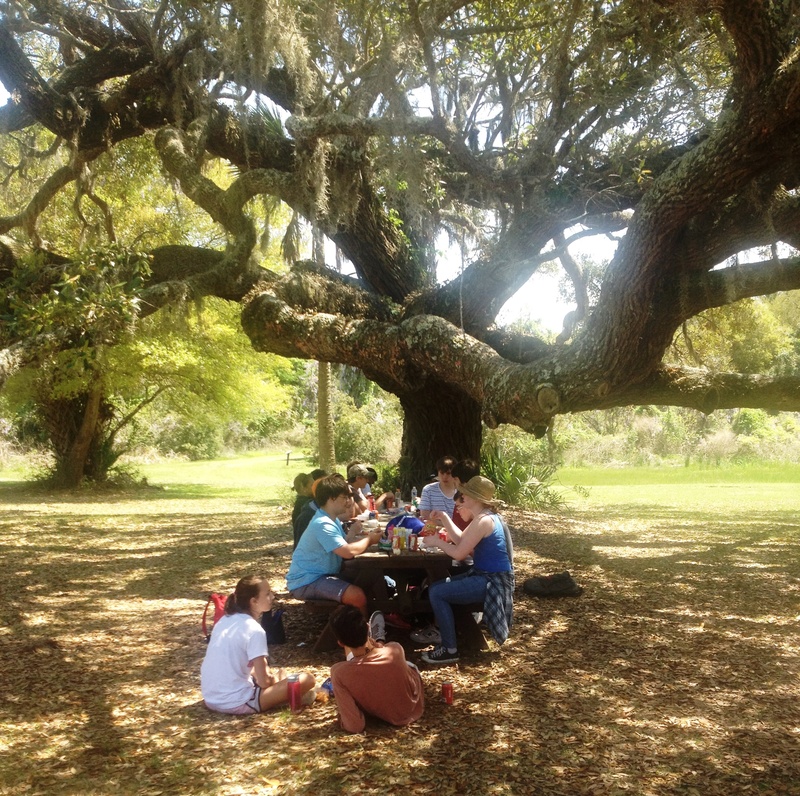 Students lunched in the shade of live oaks draped with resurrection ferns and Spanish moss. 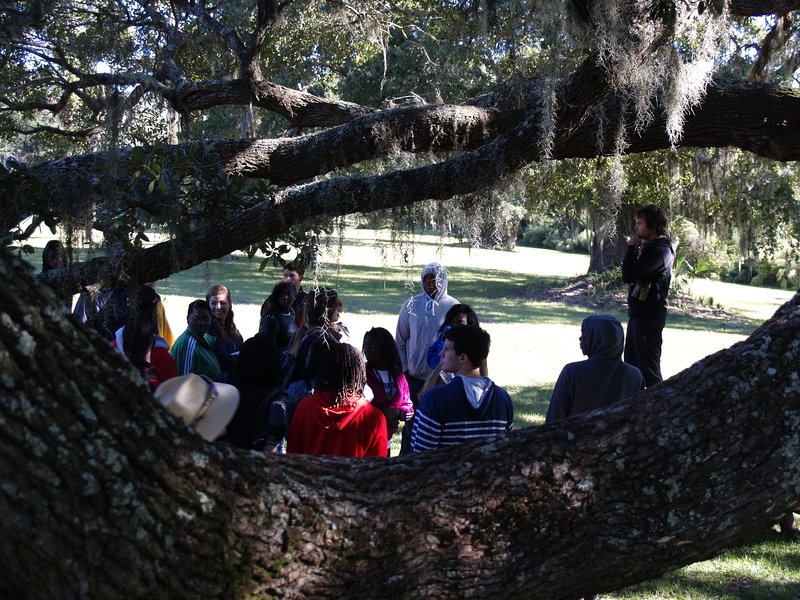 After a bit of tree climbing and a spontaneous dance circle, the afternoon was spent in the historic Dominick House. 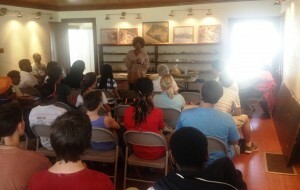 Sweetgrass basket artisan Vera Manigault guided students through the history of sweetgrass basketry and the modern Gullah Geechee culture. 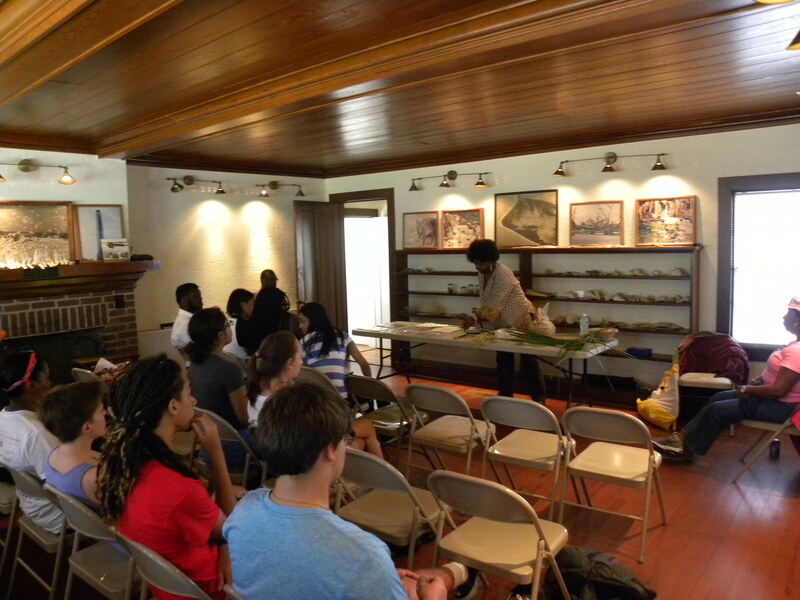 Michael Allen, a Community Outreach Specialist for the National Parks Service, then discussed the history and significance of the Gullah Geechee corridor. 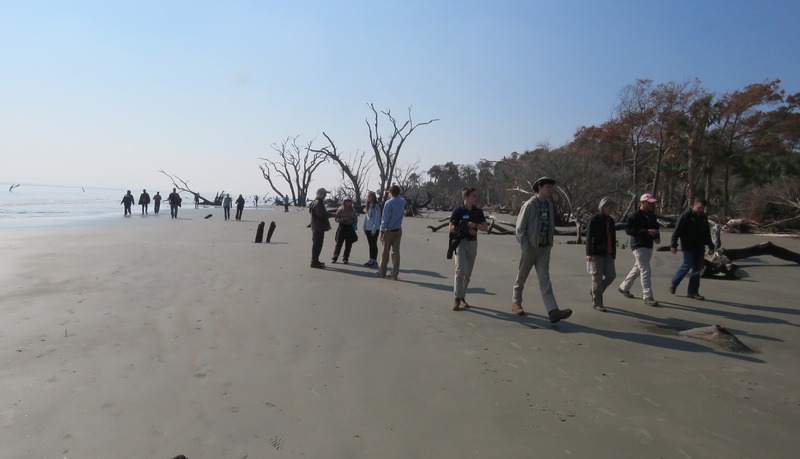 He spoke to the importance of the Lowcountry in helping to build South Carolina as a vital part of the United States both yesterday and today. 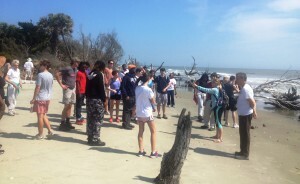 Mr. Allen summarized the day best; “We live in a special, unique, sacred place.” We have a duty to protect the diversity of life— plant, animal, and human alike— which makes the Lowcountry so special. 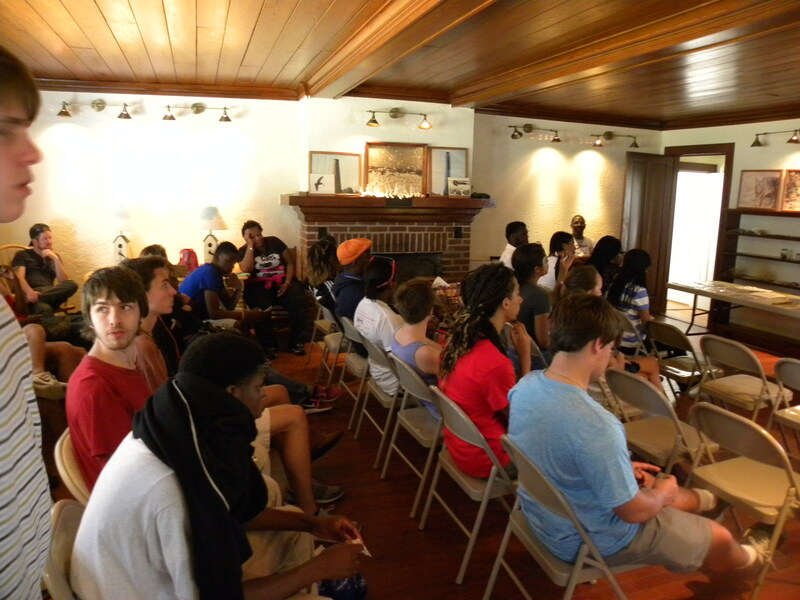 And the students of Over the Horizon have already taken the first steps in accepting that mantle. 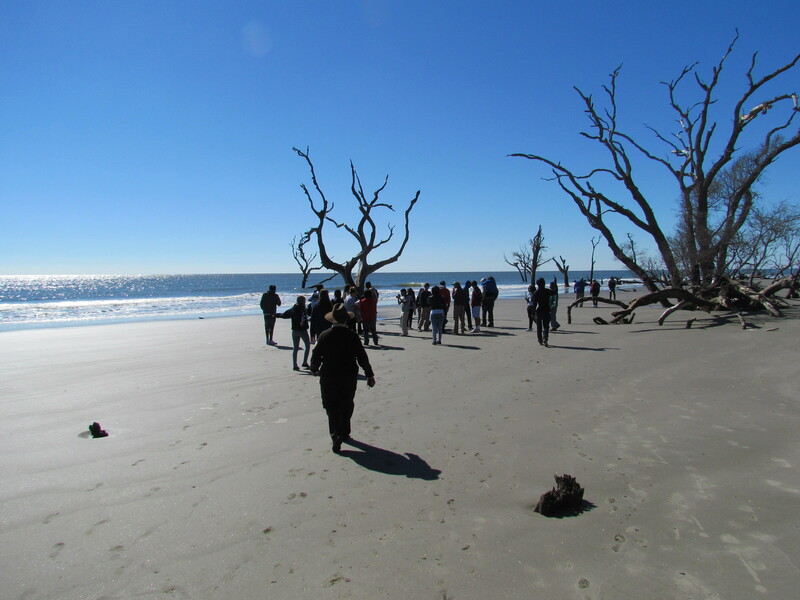 Special thanks to all the educators and volunteers that made this amazing experience possible again this fall for students from Wando and Burke High Schools.